This chapter has been partially rewritten and some of the definitions have been changed because in my view they were inconsistent. I've kept a copy of the old version for comparison. 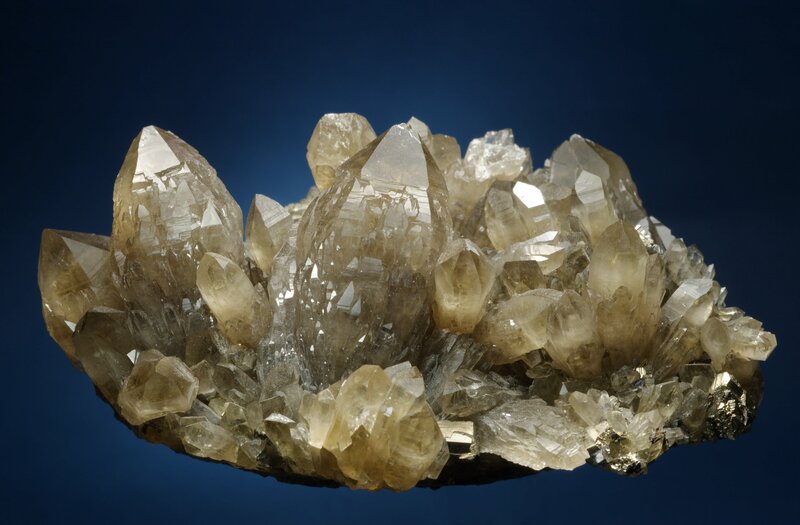 This section covers those aspects of quartz morphology that are not covered in the descriptions of crystal forms, habits, and twinning, and also covers those related to the overall appearance of crystal aggregates. Included are some phenomena in quartz which are not related to the actual shape of the crystals, but to other aspects of their visual appearance and which are an imprint of changes in the environment. Some authors distinguish color varieties and form varieties, and growth forms would be considered as form varieties. I do not call growth forms varieties, for the following reason: even a small, incomplete fraction or sample of a crystal can still be identified as a specific color variety, but this does not work for growth forms. A color variety does not loose any of its specific qualities when cut, but a form variety will. So when a jewel is cut from an amethyst scepter quartz all that will be left is an amethyst and the scepter quality will be gone. This is merely a practical consideration and if someone else decides to call a specific growth form a variety, I will not object to this. Natural crystals are full of imperfections and their crystal lattices deviate from the ideal regular geometry. Parts of the lattice can get displaced slightly and as a result peculiar patterns develop on the crystal's faces. If the crystals have a preferred direction of growth, the numbers and kinds of lattice defects may differ on the various crystal faces and this may cause deviations from the regular growth pattern of the crystals which in turn may lead to peculiar shapes. One of the possibilities is that the crystals widen in the direction of preferred growth until their tips split up into several subindividuals. This behavior is called split growth. It is a very common phenomenon not only found in quartz. 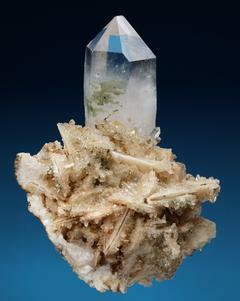 Some minerals frequently show split growth, like prehnite, epidote and, perhaps the best example, stilbite. Split growth may occur during an episode of crystal growth, for example, as a response to mechanical interference. It may also occur during the entire growth of the crystal, for example, if it is caused by the specific chemical composition of the growth solution. Rykart (Rykart, 1995) subsumes various split growth forms of quartz crystals under the German term "Sprossenquarz", coined by Stalder in 1975, which translates to sprouting quartz. 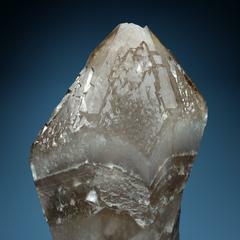 Many collectors call quartz crystals with certain split growth patterns artichoke quartz. 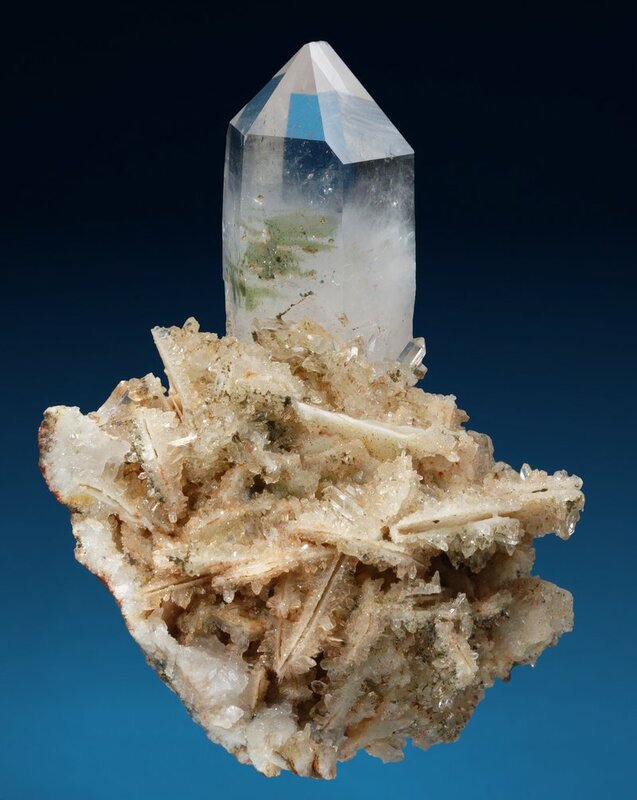 Rykart consideres them as a special case of sprouting quartz whereas I will use the term "sprouting quartz" only for crystals with a certain type of split growth, because "split growth" is already the established and appropriate English term for the general phenomenon. 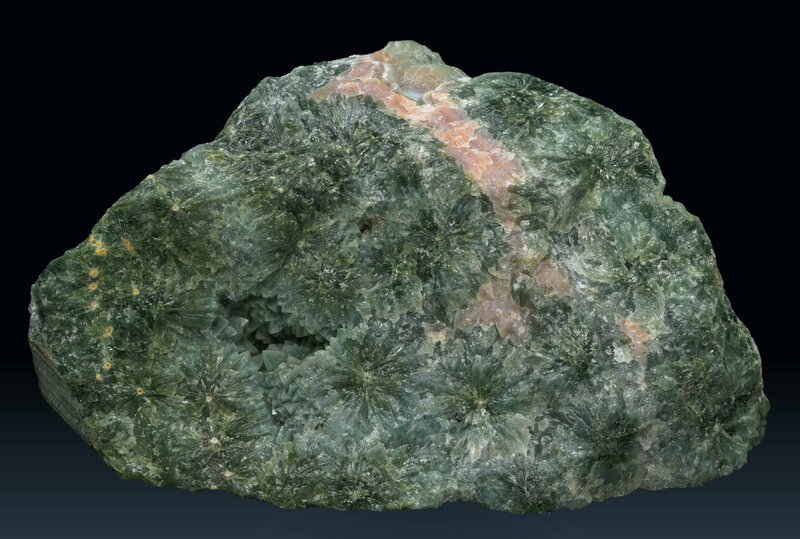 An excellent example of split growth is this specimen from Luki, Rhodope Mountains, Plovdiv Oblast, Bulgaria, that is colored green because of inclusions of an unknown mineral. It is an artichoke quartz that also shows sprouting quartz growth patterns (for definitions see below). In a sprouting quartz small daughter crystals sprout from the crystal faces (Fig.1). 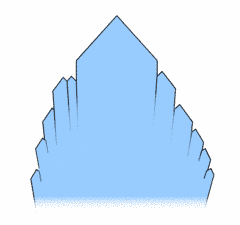 In most cases, the daughter crystals grow on the prism faces and are oriented roughly parallel to the central crystal, with the tips pointing slightly away from the crystal. I use the term "sprouting quartz" for crystals in which the sprouting crystals are a second generation on an older quartz crystal. 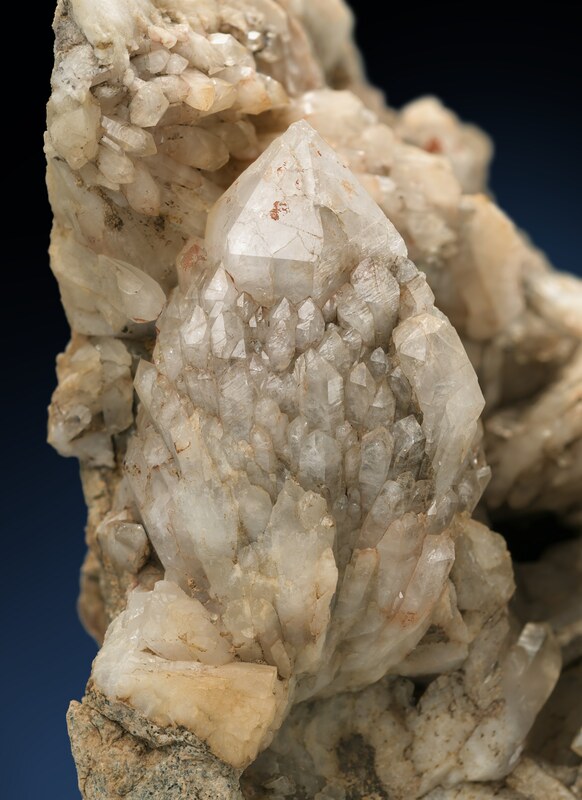 As I said before, this is a deviation from Rykart's terminology (Rykart, 1995), where "Sprossenquarz" is the general term for quartz specimen showing split growth. 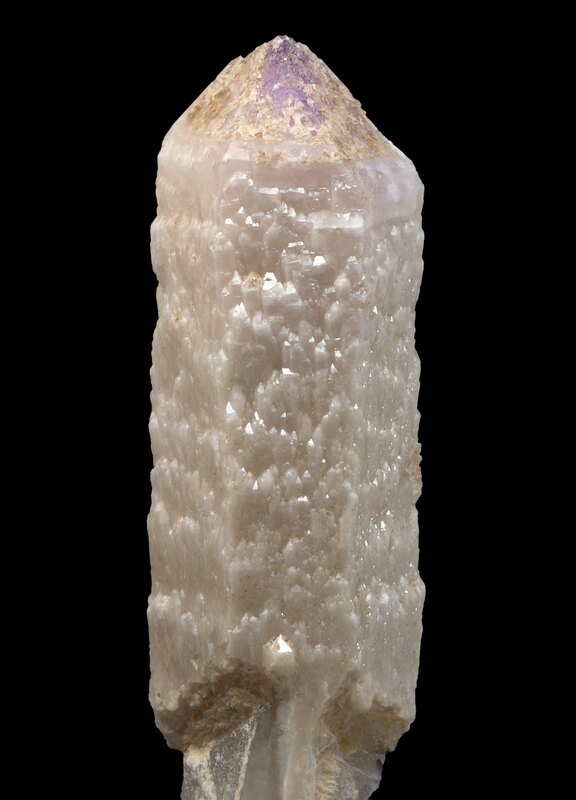 This growth form resembles a candle with lots of drops of wax on its side, hence the name candle quartz is sometimes used for it. A nice example of quartz crystals that are cocooned by a secondary layer of milky quartz from which tips of small crystals sprout out roughly in parallel to the large crystal. Their tips slightly bend away from the prism (and they have to, otherwise they would not be visible and this would not be sprouting quartz), and this causes a curved surface on the prism face. From the Landsverk I pegmatite mine, Evje, Norway. This interesting specimen is a clear rock crystal that probably was once broken at the center of the crystal. The fracture healed out, but left a milky zone inside the crystal. It also triggered the sprouting of small daughter crystals that form a wreath around the fracture zone. The crystal is from Le Zuang Guang Deny, China. 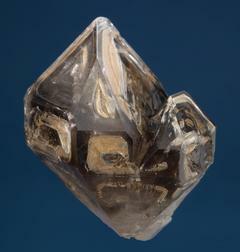 Like in the previous specimen, the split growth in the middle of the prism of the upper crystal marks a former breakage that runs through the crystal, roughly parallel to the large lower rhombohedral face. 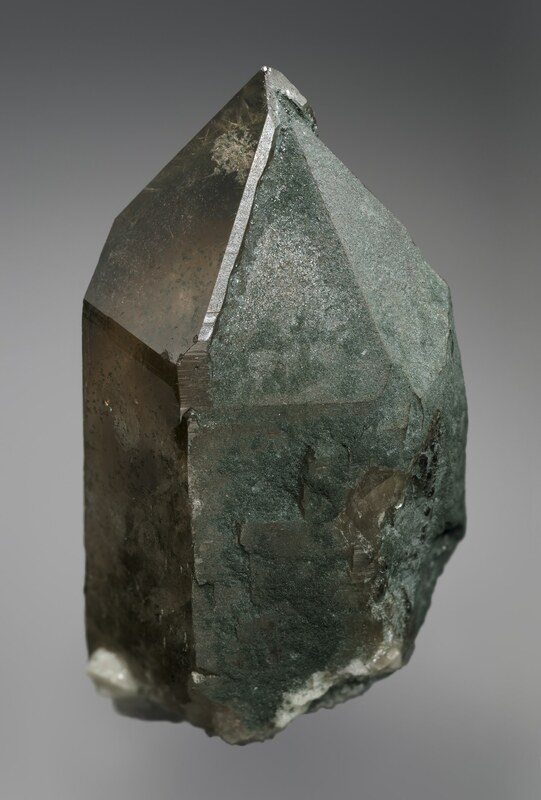 The lower end apparently suffered growth inhibition from the surrounding chlorite that is also included in the crystal, and might have caused the lower prism of the crystal to remain thinner. From Langvasseid, Sør-Varanger, Finnmark, northern Norway. This is an almost idealy developed sprouting quartz from a miarole or pegmatite pocket at the western Erongo mountains, Namibia. Many small, upward-pointing crystals sprout from a milky sheet on the prism faces. 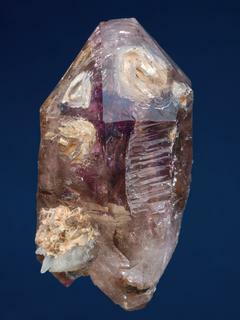 The amethyst-colored tip of the underlying crystal has not been overgrown completely and is peeking out at the top. You will note that the daughter crystals appear "in waves", but it is hard to tell why - it might be a matter of "self-organizing patterns" during growth but could also reflect the horizontal striation or small steps of rhombohedral faces commonly found on the prism faces. 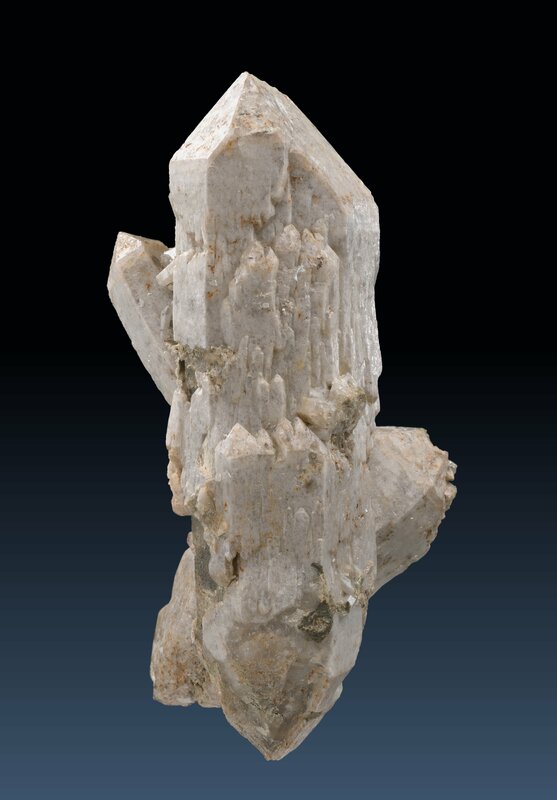 Like the previous crystal, this specimen is from a location at the western Erongo mountains in Namibia. 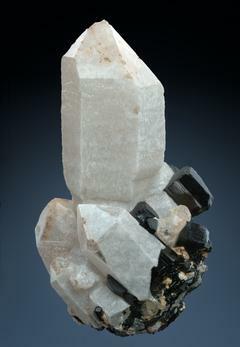 The light gray quartz crystals are accompanied by stubby black tourmaline crystals. 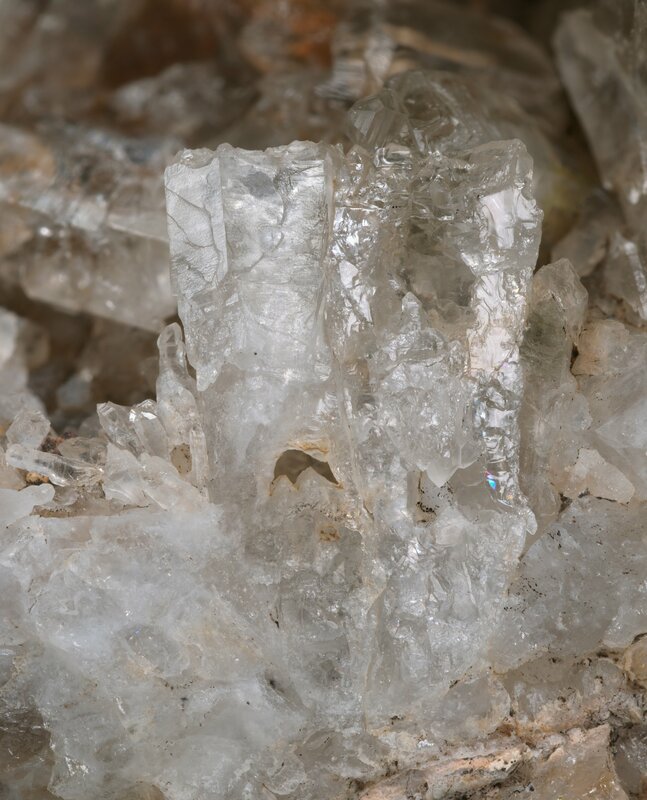 Although the quartz crystals first look like ordinary milky quartz, the cores of the crystals are a bit smoky and more clear (you can see that at the small crystal pointing to the upper left corner that has a small dent on its left side). The prism faces show a silky shine that is caused by small white daughter crystals sprouting from the surface, much like those sprouting from the prism in the previous crystal, but much smaller. So this presents an intermediate step in the development of a sprouting quartz. 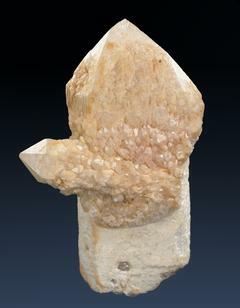 Since this specimen is from a miarole or pegmatite pocket, the initial step might have been a short phase of dissolution or etching of the crystal. After the conditions changed again and the crystal growth resumed, daughter crystals were sprouting from the altered prism faces. 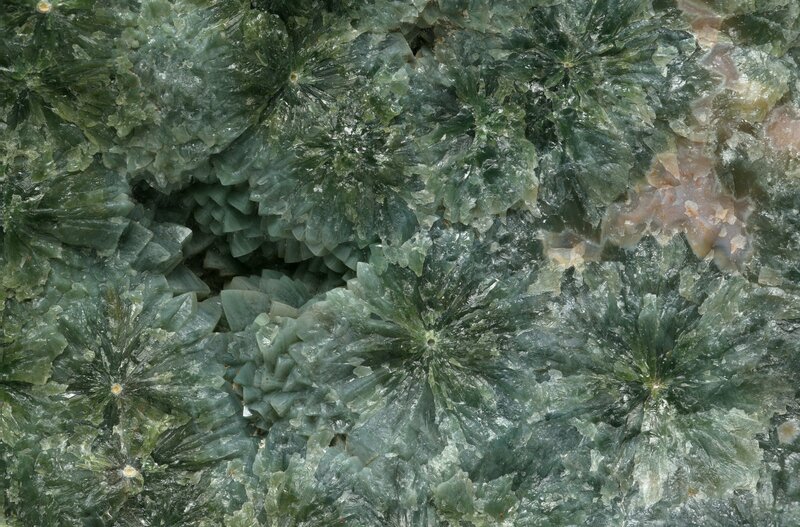 In a typical artichoke quartz the crystals get subdivided in a way that resembles the arrangement of leaves on an artichoke head (Fig.2). In some cases this involves primarily the rhombohedral faces of the tips and these crystals indeed look a lot like artichokes. 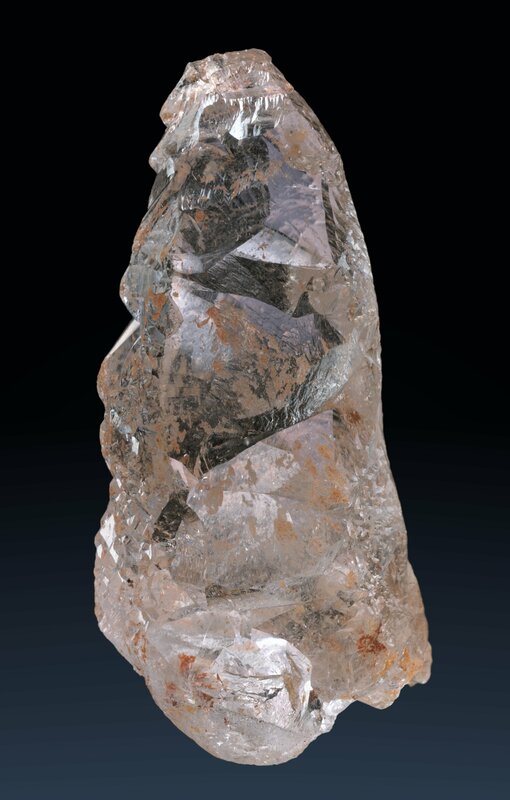 In other cases, the subdivisions can also be seen on the prism faces as "daughter crystals", resulting in a sheaf-like look, often with a large central crystal. Transitions between these two extremes are common, while crystals with a "pure" artichoke-like look are rare. 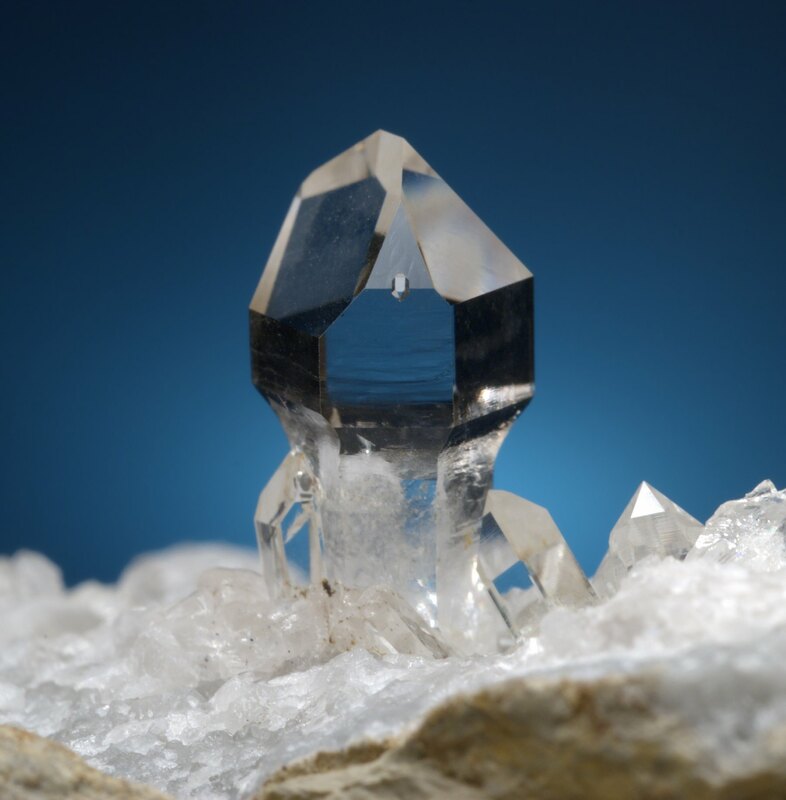 The common denominator (and also the difference to sprouting quartz) is that the c-axes (the axis that goes from tip to tip in a double-terminated crystal) of the crystals and "daughter crystals" all point roughly to the same spot at the base. This is an indication that the subindividuals (or "daughter crystals") of an artichoke quartz grew simultaneously, and not as a second generation, as in typical sprouting quartz. 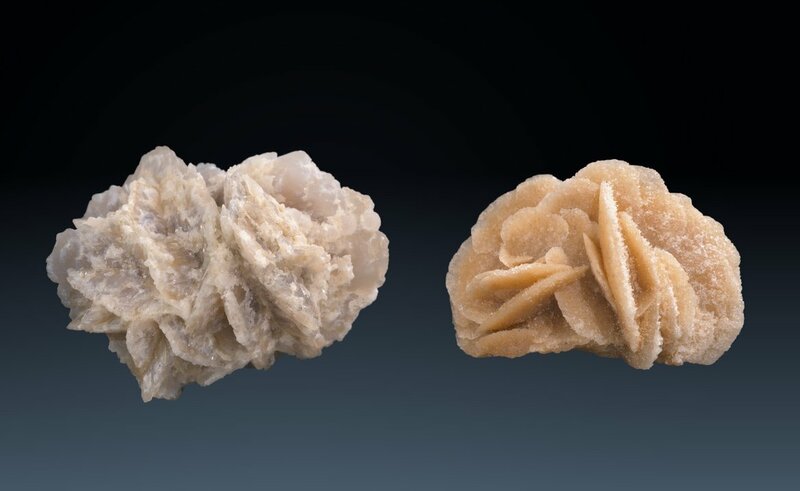 This interpretation is further supported by the fact that on many specimens the small "daughter crystals" and "branches" exhibit the same growth patterns and surface structures and look like miniature versions of artichoke quartzes by themselves. Artichoke growth forms are apparently caused by lattice defects (irregularities in the crystal lattice) that are induced, for example, by quick growth and trace elements and other impurities in the lattice. It often occurs on hydrothermal ore veins (the artichoke quartzes from Romania are a well known example), but it can be found in many different environments, like pockets in sedimentary rocks, skarn zones, alpine-type fissures or pegmatite pockets. This is an almost idealy developed artichoke smoky quartz. Each of its rhombohedral faces carries another rhombohedral "face" at its center that looks like a mosaic of triangles, as it is made of even more sprouting crystal tips. This growth pattern is very different from the one in the previous image. Note that the edges between the rhombohedral faces tend to stand out as frames above the faces as it is typical for skeleton quartz, indicating fast growth. From Usingen in the Taunus mountains north-west of Frankfurt, Germany. 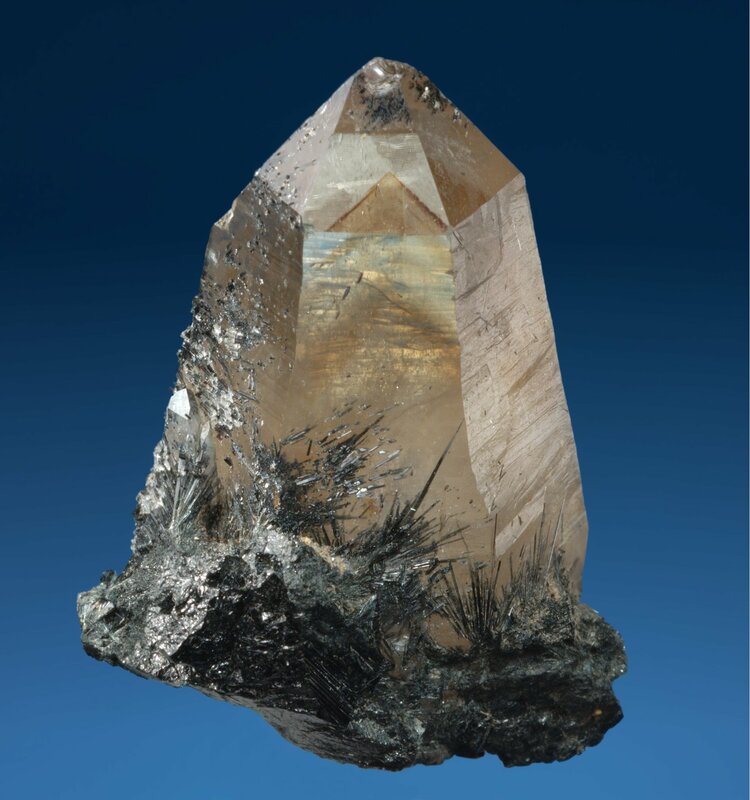 The crystal has been part of a crystal cluster similar to the one from the same location shown in the phantom quartz section, so it does not show any prism faces. The zonar color distribution is typical for that location and shown in another specimen on the smoky quartz page. 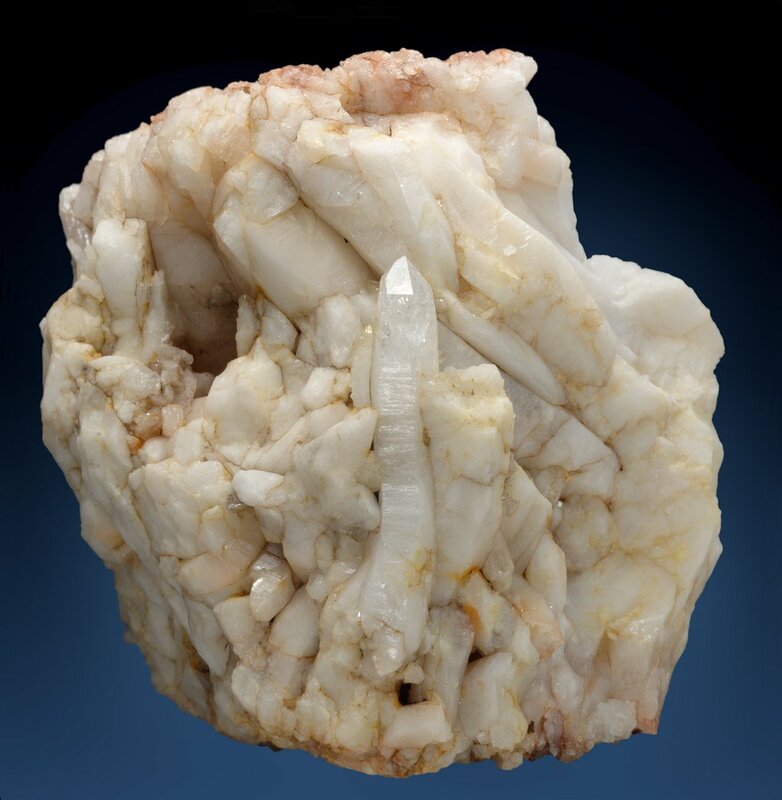 A very nice milky artichoke quartz from Seulo, Barbagia, Sardegna, Italy, sits inside a quartz vein. The daughter crystals are arranged in the sheaf-like way shown in Fig.2. It is obvious that they all originate from a common point at the base of the crystal. Another artichoke quartz specimen from the same location at Seulo, Sardegna, with two smaller, milky artichoke quartz aggregates. Quartz crystals from ore veins in Romania often show artichoke growth. This is a typical specimen from an ore vein in Cavnic, Maramures, Romania. The brass-colored metallic mineral is pyrite. The rhombohedral faces appear slightly bent and convex. r- and z-faces cannot be distiguished and the crystals have a pseudohexagonal habit. If prism faces are present, they gradually merge into the rhombohedral faces. This specimen from Romania is a bit smoky and has most likely been irradiated. The crystals are more barrel-shaped than those in the previous specimen, and between the large ones are smaller crystals with a trigonal habit. At the base of the specimen you can see a few pyrite crystals. An artichoke quartz that resembles a fir cone sits on a matrix of brass-colored pyrite with a blue tarnish, possibly chalcopyrite. From Baia Sprie, Maramures, Romania. Collection of the Spirifer Geological Society, Poland. This is one of the infamous irradiated Romanian artichoke quartzes, but the fact that they have been artificially turned to smoky quartz helps in photographing their overall shape. 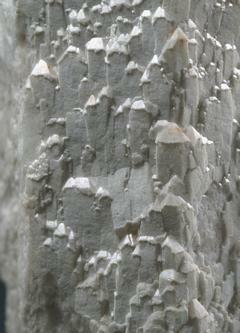 It is covered with small dolomite crystals on the back side. From Cavnic, Maramures, Romania. A close-up of the tip of the same specimen, showing the surface patterns at the transition from the rhombohedral to the zone of sprouting crystals. 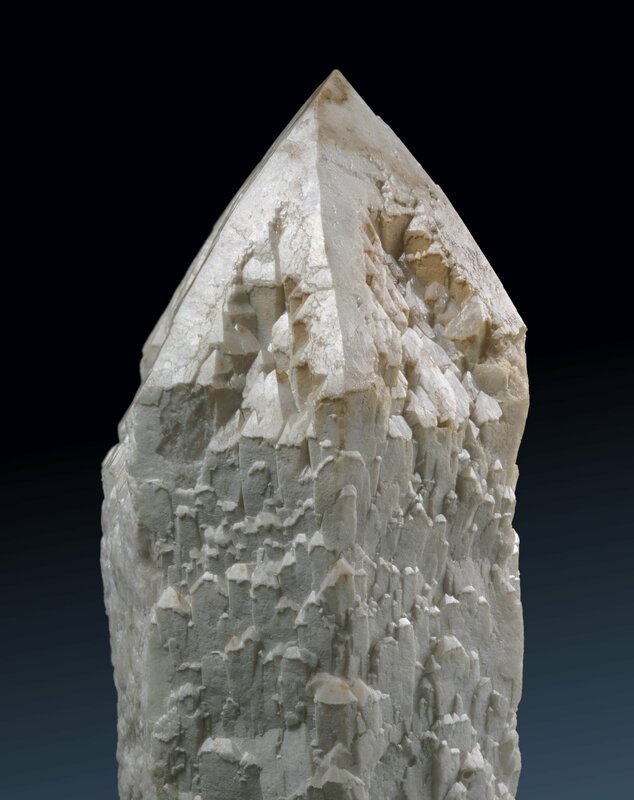 The small sprouting crystal tips show the same pattern as the main tip, so the cause for the development of this growth form must be a condition in the geological environment that is sustained over some time, perhaps during the entire growth of the crystal. Citrine and smoky quartz from Lueni, Katanga province, Congo, all show this peculiar growth form with one big central crystal being surrounded by many smaller crystals. All the crystals seem to emanate from the same spot, very similar to the milky quartz from Sardegna shown above. There is a more yellow specimen in the citrine section. Amethyst specimen from Romanian ore deposits are famous for their peculiar growth forms, which include specimens that resemble crystals from Amatitlan, Mexico, and others that show extreme artichoke growth. 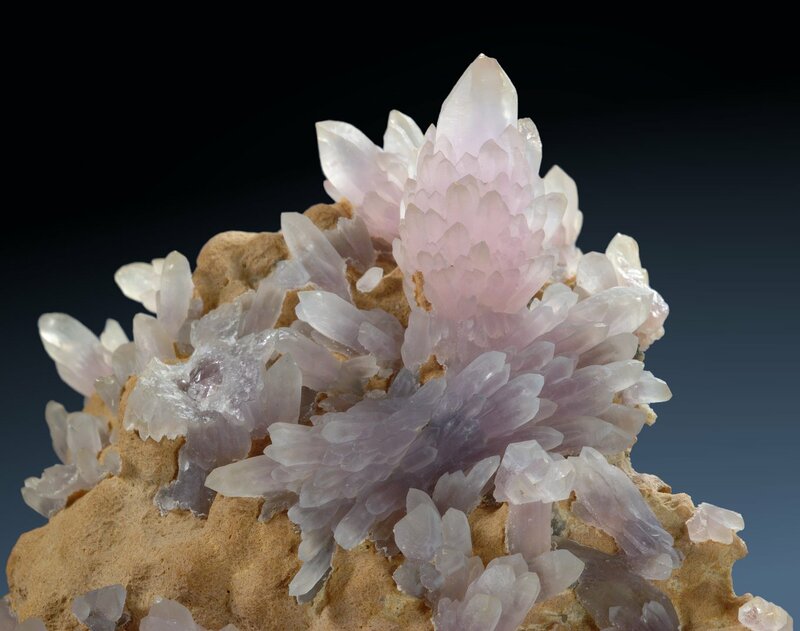 These pale amethyst colored crystals look a bit like the crystals from Seulo and Lueni, but the sprouting crystals are only a bit smaller than the central crystal, and the large upright crystal indeed looks a lot like an elongated artichoke. The surface of the crystals is dull and the crystals are not transparent, but translucent. 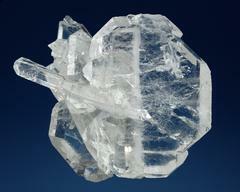 Before the large upright crystal there is a "sheaf" of double terminated crystals lying on the matrix. 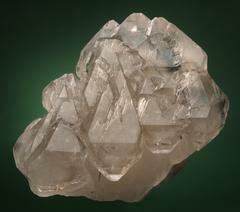 This group does not show a central crystal at all, and crystal groups like that are sometimes said to show "sheaf-like growth". The brown matrix has a strange surface structure because the crystals have been etched out of a carbonate layer. 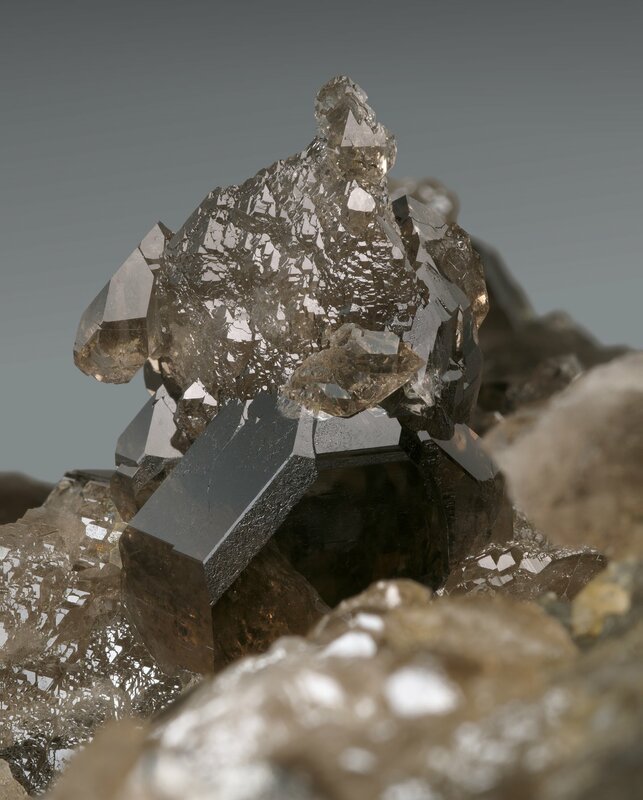 It still contains galena and pyrite. The specimen comes from the Turt Mine, Satu Mare, Romania. Nature doesn't know about categories, so there are specimen that are in between the ideal artichoke and sprouting quartz growth forms and look more like "sproutichokes", and specimen that show split growth in combination with other growth forms. 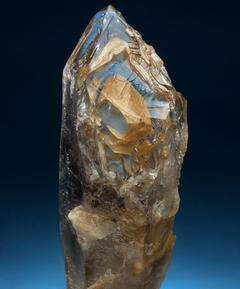 This is a typical example of crystals commonly found in the Itremo region in Madagascar, sometimes called candle quartz. These crystals represent the transition from artichoke to sprouting quartz growth forms. The central crystal is milky while the little crystals on the prism have been dyed by iron oxides, so the core seems to predate the smaller crystals. However, most (but not all) of the small crystals still seem to radiate from a common spot at the base like in typical artichoke quartzes. Prase from Dalnegorsk, Russia, typically shows small sprouting quartz crystals all over the prism faces and is easily recognized. The crystal is colored green by inclusions of actinolite needles. It's difficult to tell if the small crystals are secondary or if the crystal exhibited split growth during its entire development. The next two pictures show a scepter quartz, had been labeled "Campo Formoso, Bahia" but is probably from the Serra Negra deposit, Patrocínio, Minas Gerais, Southeast Region, Brazil, with a scepter that shows typical properties of sprouting quartz specimen. 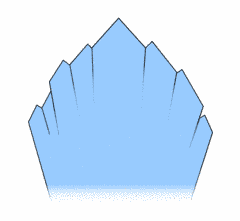 The lower parts of the rhombohedral faces are composed of smaller crystal tips that grew roughly, but not exactly, parallel to the first generation crystal underneath. The edges between the faces are less disintegrated than the centers, something commonly observed on crystals of this type, for example on the Usingen specimen shown above. It is sometimes interpreted as skeletal growth pattern indicative of quick growth. 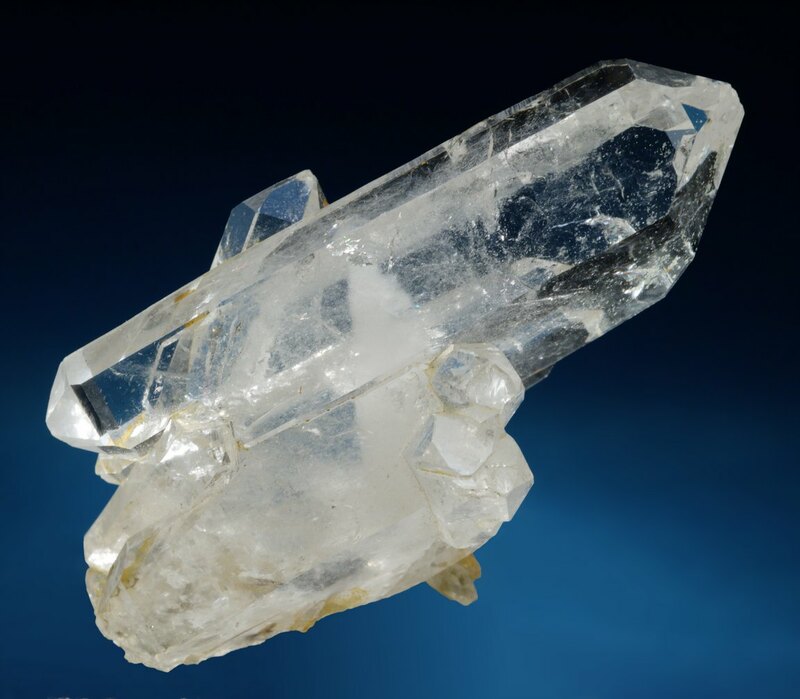 The core of the first generation crystal is transparent, but its prism is covered by a thin layer of a white material that feels a bit like broken ceramics, perhaps very fine-grained quartz. The relation to sprouting quartz gets more obvious when we look at the flip side of the specimen, shown on the photo below. 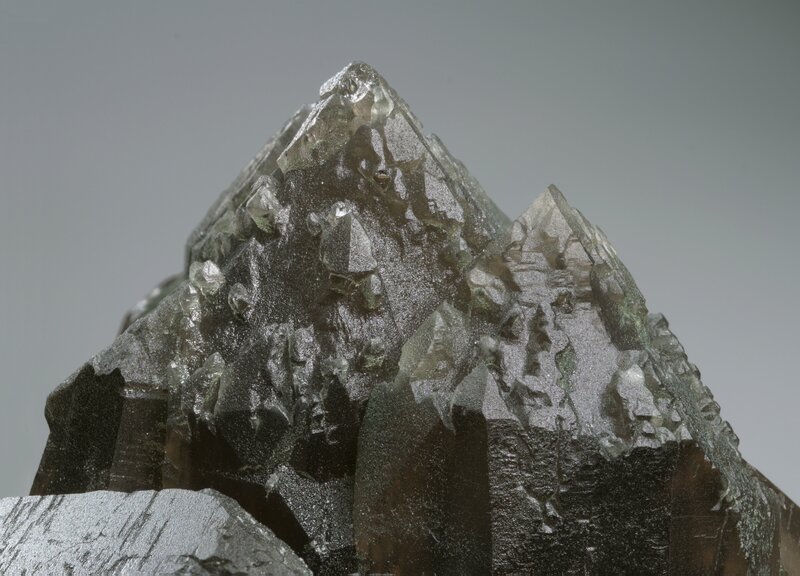 A larger and very likely older daughter crystal is branching off to the left, and its prism faces are covered by small sprouting crystals, similar to the ones of the specimen from Itremo and Seulo. The sprouting crystals on the prism faces gradually change orientation at the transition from the daughter crystal to the main crystal. 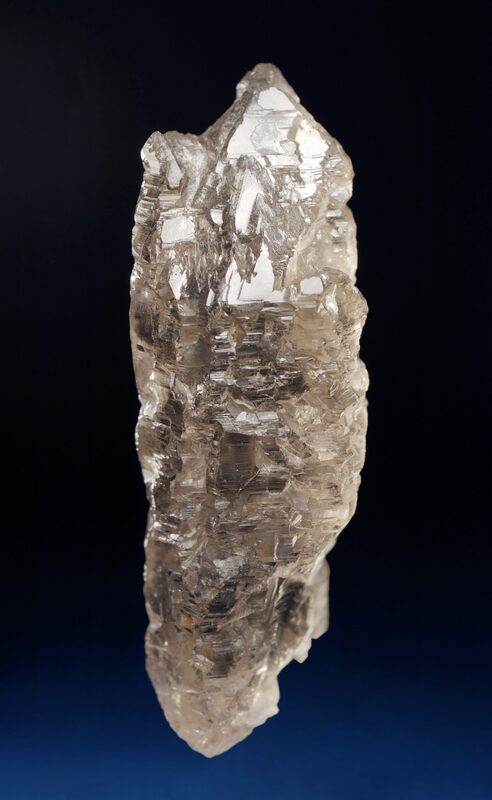 When a central large crystal is surrounded by smaller, parallely grown crystals that are tightly attached to the central one, the specimen may look like the tower of a cathedral (Fig.3). At a first glance, these "cathedral", "babel" or "babylon" quartzes might be confused quartzes that show split growth. 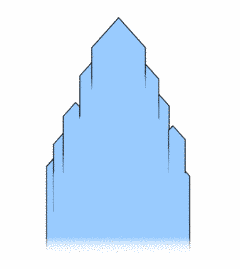 But in cathedral quartzes all crystals, and accordingly all rhombohedral faces at the crystal's tips, are in parallel, and light reflections appear almost simultaneously on faces of the same type. 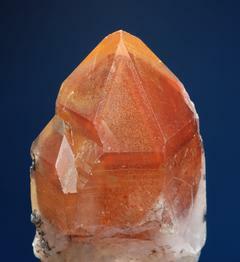 A cinnamon colored smoky quartz with a cathedral habit form the Ofenhorn in the Binntal, Wallis, Switzerland. Quartz crystals that suffer mechanical stress (e.g. due to tectonic processes) during growth might break roughly perpendicular to their c-axis. The resulting parts are sometimes only slightly displaced, so their crystallographic axes are not parallel any more. As freshly broken surfaces are thermodynamically very instable in a saturated solution, they will grow quickly and the fracture will soon be healed. If this process repeats a few times and the crystal parts always get displaced in the same way, the result can be a crystal that is apparently bent. 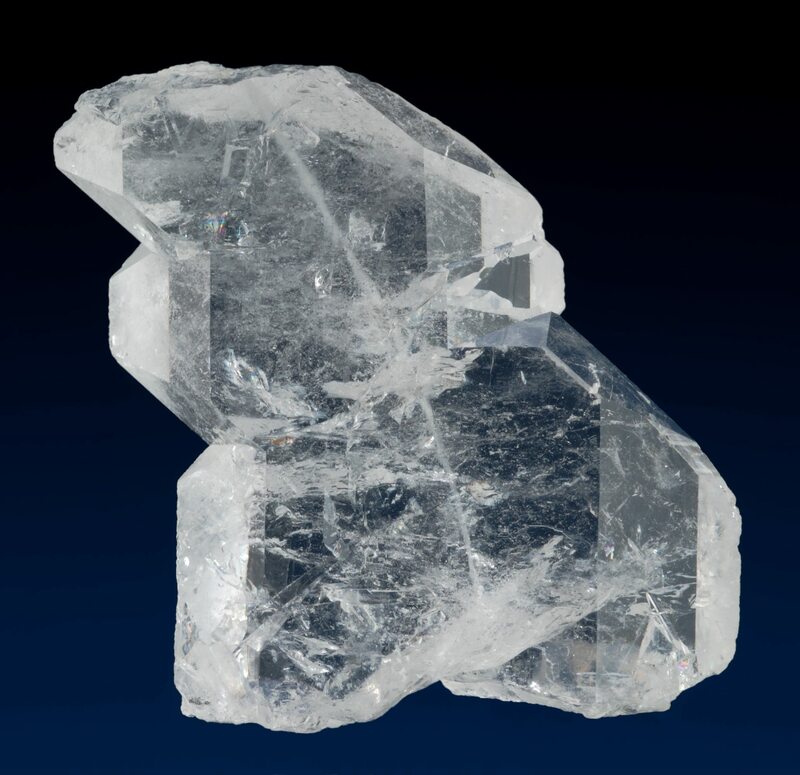 The curved part of the crystal that frequently broke is always milky and only translucent, because liquids got captured in the crystal during the rapid growth of the fractured surface. 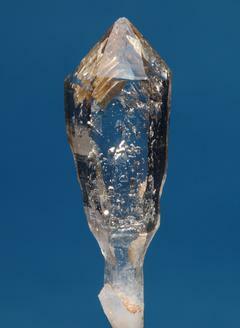 The image shows a bent crystal from Shir Kuh mountain (lion mountain), Yazd Province, in Iran. You can see that it is actually not bent smoothly, but broken and healed at two places. Note the small crystals that sprout from the upper fracture. The dark irregular spots are covers and inclusions of chlorite. Donated by Maziar Nazari. This is a piece of a quartz vein that has been subject to repeated shearing. It consists of repeatedly broken and healed milky quartz crystals. 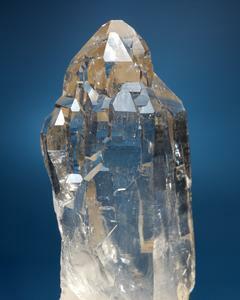 In the center there is an almost s-shaped crystal with a clear and shiny rock crystal tip. Found at Arbaz, Valle de Aosta, Italy. 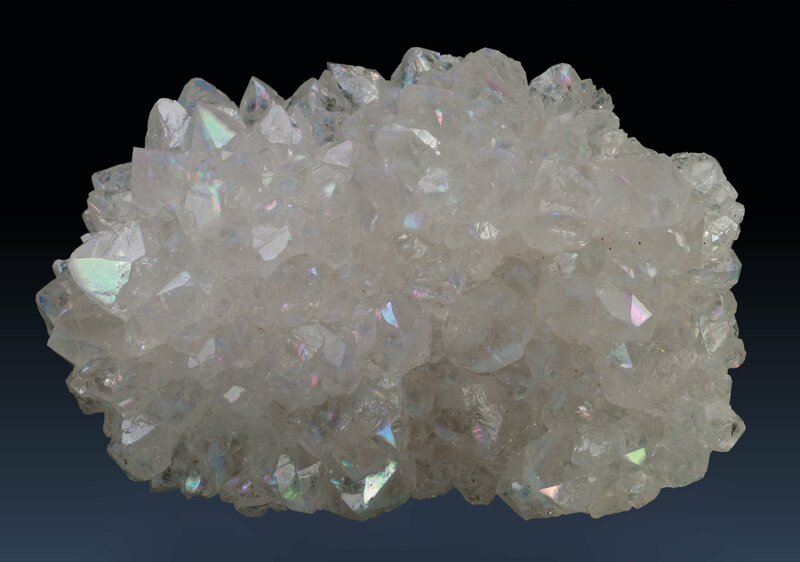 A cactus or spirit quartz is a quartz crystal that is encrusted by a second generation of smaller crystals grown on its prism faces. 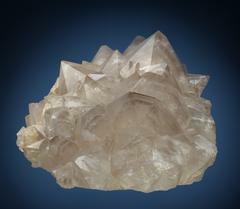 Another term used is pineapple quartz. 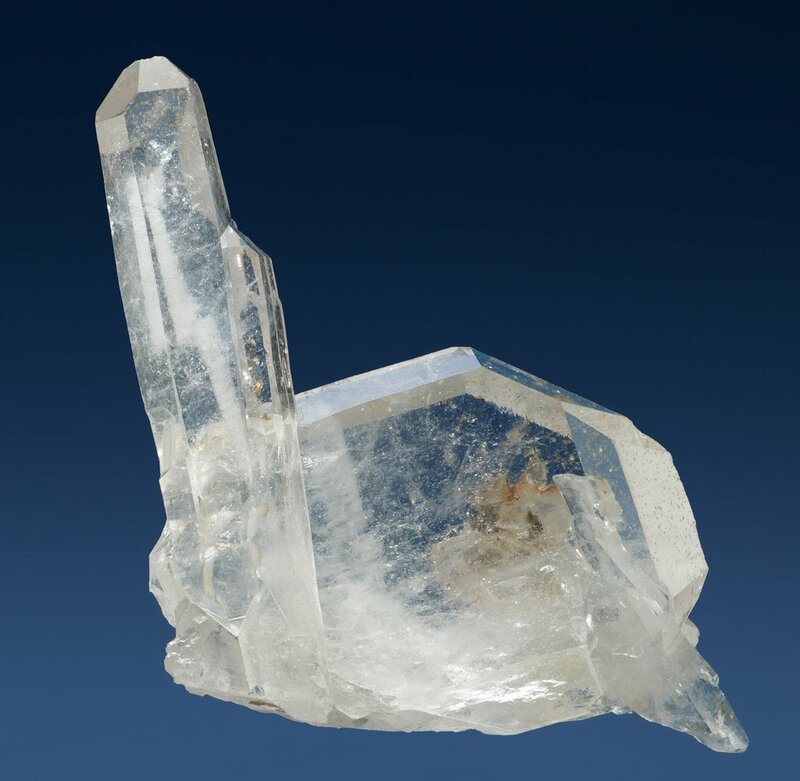 Different from candle quartz, the small crystals point away from the prism (see Fig.4), and their orientation is not related to the crystallographic orientation of the central crystal. Interestingly, the rhombohedral faces of the first generation crystal's tips usually remain free. 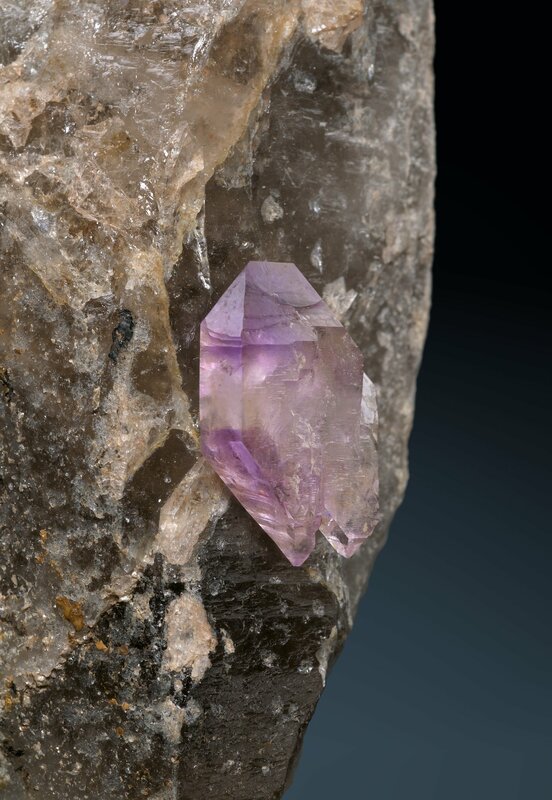 The most famous cactus quartz is amethyst found at a few locations in South Africa, like the specimen to the right from the vicinity of the Boutenhouthoek Farm, N.E. Pretoria (Sprich et al., 2003; Cairncross et al., 2004). On its left side one can see a cross section of a crystal, with a cut through the first generation hexagonal prism that is surrounded by younger small crystals. The specimen is also presented in the amethyst section. A capped quartz is an extreme case of a phantom quartz: In a short period during the growth of the crystal a lot of material precipitated on the crystal's rhombohedral faces, forming a thin layer within the crystal. 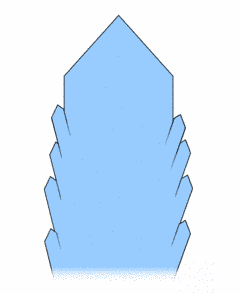 The "upper part" of the crystal (often a scepter) is only weakly connected to the "lower", older part and sometimes both parts can be separated easily. The upper part looks a bit like a cap because its lower side is the negative form of the former crystal tip. Changes in the geological environment (rising temperatures, aggressive solutions, increasing pressure) can lead to the complete or partial dissolution of a crystal. Depending upon its inner structure and on how much is dissolved, the pattern that is etched into the crystal varies. Not all parts of a crystal are equally susceptible to etching - the thermodynamically more stable faces can withstand the attacking solutions better. Smaller crystals get dissolved more easily and at an earlier stage than large ones. Mild forms or etching can be seen on many crystals and can give a clue about the internal structure of the crystal. Most corroded crystals show signs of healing, leading to interesting surface patterns. This clear smoky quartz from the Shigar Valley, Skardu, Northern Pakistan, has once been corroded very deeply, but started to grow again. The result is a crystal with an irregular overall shape, covered by many parallel crystal faces whose orientation reflects the crystallographic orientation of the original crystal. This surface pattern, with deep grooves and dents etched into the crystal is typical for quartz with a so called macromosaic structure. 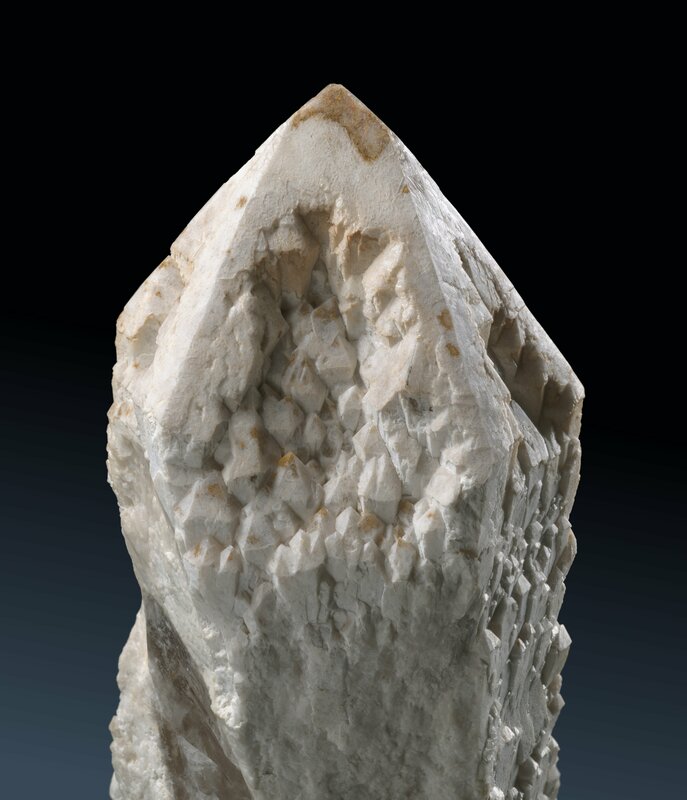 This image shows the clear tip of a rock crystal from Antsirabé, Madagascar, with a peculiar surface structure. It is covered by intersecting grooves that run roughly in parallel to the edges of the faces, on the large rhombohedral r-face most of them parallel to the upper right edge. The prism faces show grooves that mostly run horizontally, and the small triangular z-face to the right shows grooves that run parallel to its left edge. The cause of this pattern is very likely a period of superficial etching of the crystal, possibly followed by a short period of growth. The growth period might have been too short to form a complete layer. 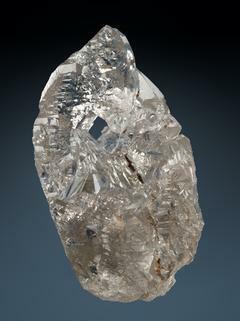 Another view of the whole specimen can be found in the rock crystal section. Quartz crystals from pegmatite or miarolitic pockets in granite are often not shiny, but dull, even if their interior is clear. The hot, hypercritical fluids that percolate in the cooling granite are rich in aggressive agents like hydrogen fluoride that will etch quartz very easily at temperatures over 400°C. This smoky quartz crystal came from a pocket in granite near the village of Priatu, S. Antonio di Gallura, Sardegna, Italy. Its surface is dull and it is partially covered by thin, white layers of quartz with a very rough surface. An apparently partially dissolved and healed crystal from a miarole pocket in granite. 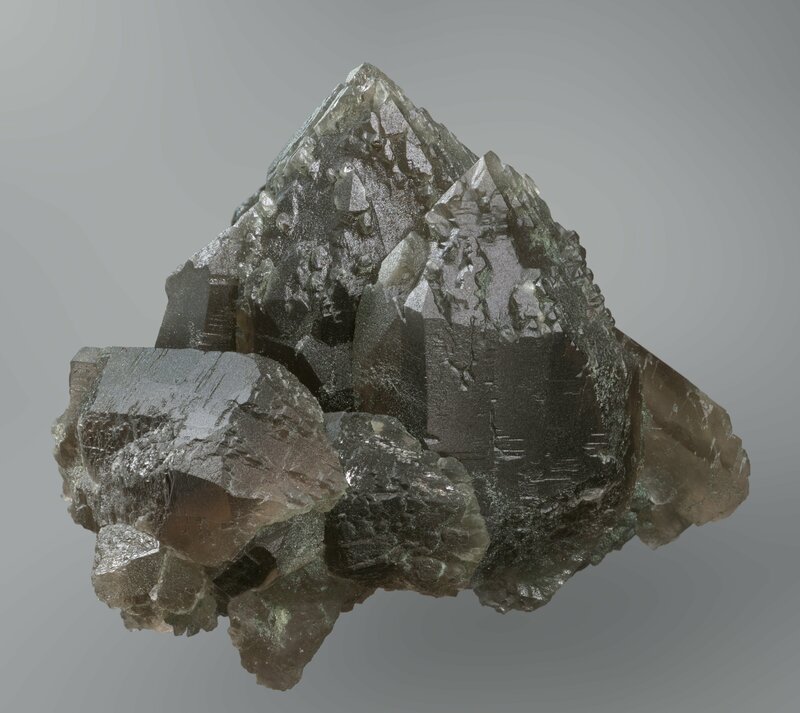 It's easy to tell that the crystal came either from a pegmatite or miarole because there are a number of needle-like black tourmaline crystals. 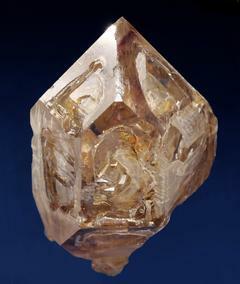 The prism shows numerous open cavities and dents, a part of the crystal's surface is dull and there is an impregnation of an unknown brown dye at the left prism face. The specimen is from the western Erongo mountains in Namibia. 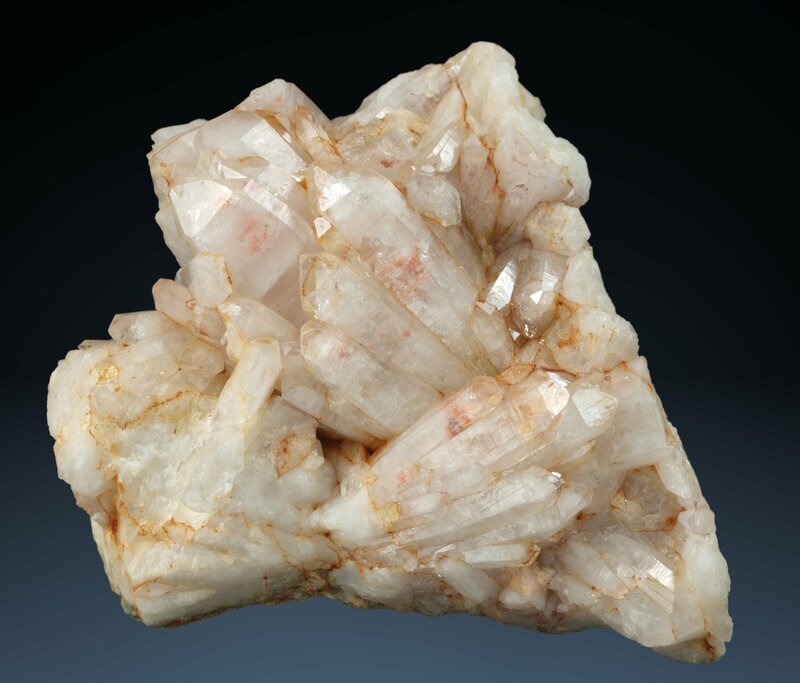 This rock crystal from an alpine-type fissure in the Ganesh Himal near Tipling, Dhading District, Nepal, is a difficult subject, because some of the surface patterns resemble those found on skeleton quartz crystals. The edges of the prism appear rounded, so the cross-section of the crystal is not six-sided anymore. However, the edges are not smooth but rough with sharp grooves that run through at different angles, depending on the particular crystal face. The long vertical face to the right that carries oblique grooves is probably an x-face or another trapezohedral face that are common in rock crystals from that location. The large green patch shining through is caused by chlorite inclusions. The crystal might very well have gone through a number of phases of both dissolution and quick growth. Dissolution can lead to a jagged and bizarre shape but also to rounded surface structures that remind one of partially molten ice. 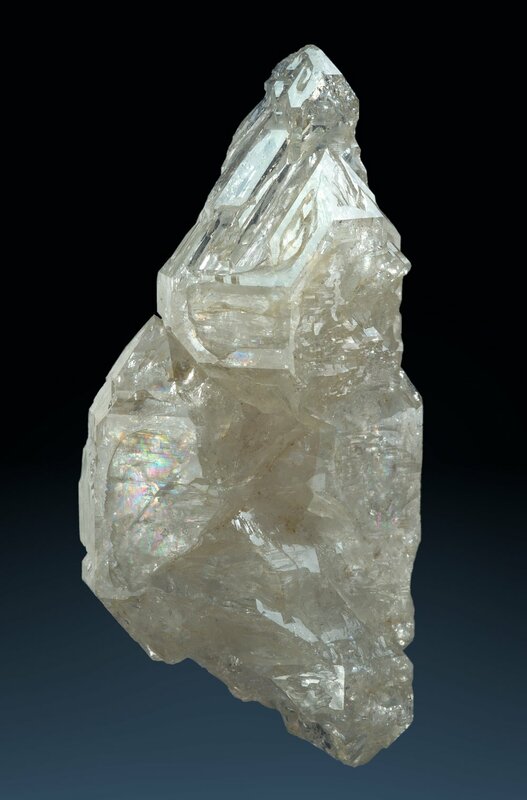 This clear rock crystal has been dissolved beyond recognition, but although there is no clearly identifiable face on the crystal, the experienced collector will still identify it as quartz because of some characteristic surface patterns that are also found on many skeleton quartz crystals. Compare this to the preceding specimen. From Antsirabé, Madagascar. 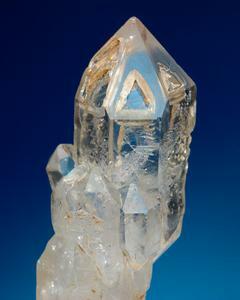 "Elestial quartz" ("heavenly quartz") is a term that apparently came up with the esoteric renaissance. It is not a very well defined term, and very often confused with other (rather strictly defined) growth forms. Often it is used as a synonym of "Jacaré Quartz", (also known as Crocodile or Alligator Quartz). To get an idea of what is meant (or to understand why I came to the conclusion that it is a very fuzzy term), you have to look at a few dozens of images on various commercial crystal websites. Most images show parallel grown small scepters, some show skeleton quartz, some single scepters that grew sideways, and some show forms in between these, like skeletized scepters. The website www.majestic-quartz.com tries to give an answer to the question What Is An Elestial? If you read it you will get the impression that very different mineralogical phenomena have been embraced under the same term. What really counts is the overall visual appearance. An idealized definition might be: elestial quartz is a quartz that has small crystals grown on the rhombohedral faces of a greater crystal. Since the smaller crystals grew as a continuation of the crystal lattice of the underlying greater crystal, their rhombohedral faces are all oriented in parallel. 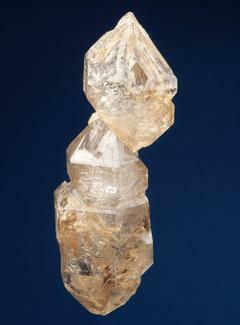 In a sense, it is a multiple scepter quartz. As some people seem to get it wrong, it should be stressed that such a pattern cannot be caused solely by natural etching of a crystal, it is a growth form. However, such a growth could be triggered by the surface structure of a formerly etched underlying crystal. 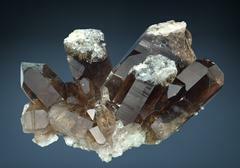 The image shows an elestial smoky quartz from Minas Gerais, Brazil. 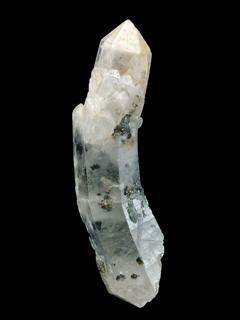 It likely came from a pegmatite, as there are two inclusions of black turmaline needles. That particular specimen shows conchoidal growth patterns on the right side which resemble those seen in many skeleton quartzes, and which look a bit as if the crystals were damaged. So some degree of skeleton growth might have played a role during the formation of these crystals. It is not uncommon for scepters to be skeletized. It is the parallel arrangement of triangular crystal faces that inspired its naming: "Jacaré" means alligator in Portuguese, referring to the similar pattern seen on the back of an alligator. 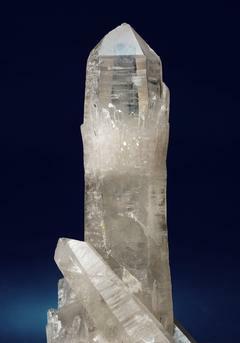 Faden quartz is the anglicized version of the German "Fadenquarz". "Faden" (pronounced "fah-den") means "thread" and refers to a white line that runs through the crystal. 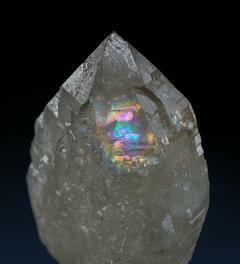 The first image is a scan (not a photo) of a typical faden quartz from Arkansas, U.S.A. The white, cloudy faden runs from left to right through the entire specimen. Faden quartz forms in cracks in the host rock that widen slowly. If the crystal is attached to both walls of the opening, it might be ruptured when the crack continues to open. This rupture will heal again, so a single crystal is once again connected to both walls and the next cycle of widening, rupture and healing can start. The repeated rupturing and healing leaves a scar of liquid and gas inclusions in the crystal: a white thread, the faden. 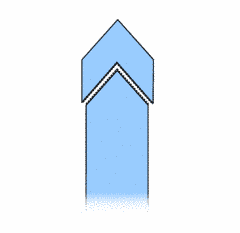 The faden can be seen best in crystals that grew parallel to the wall, because the speed of growth is usually larger along the crystals c-axis (from tip to tip). Initially the faden quartz might have been thin, but it gets wider as the crystal continues to grow and often assumes a platy shape. Now that we know how faden quartz forms, let's look at the first image again. 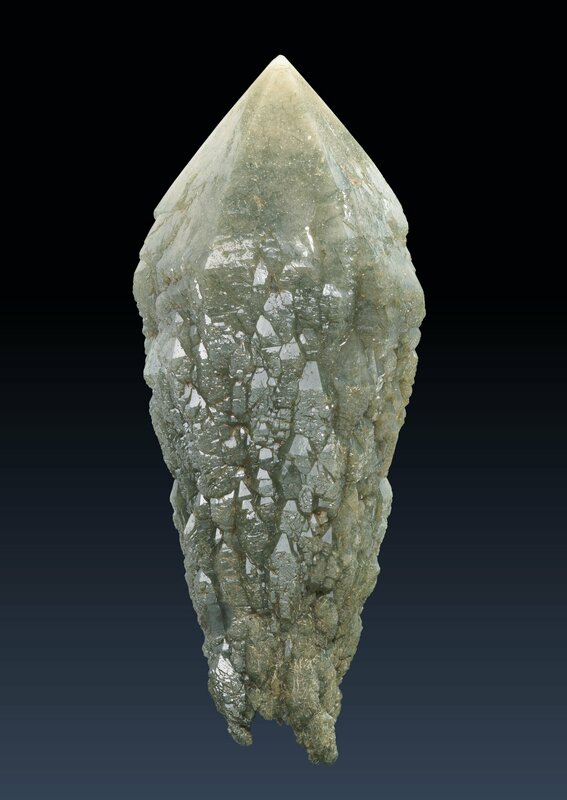 You will note that the specimen is wider than high, or, in other words, the faden is longer than the greatest distance from end to end of a single crystal subindividual. How can that be? As I said, the speed of growth is greater along the c-axis than perpendicular to it. 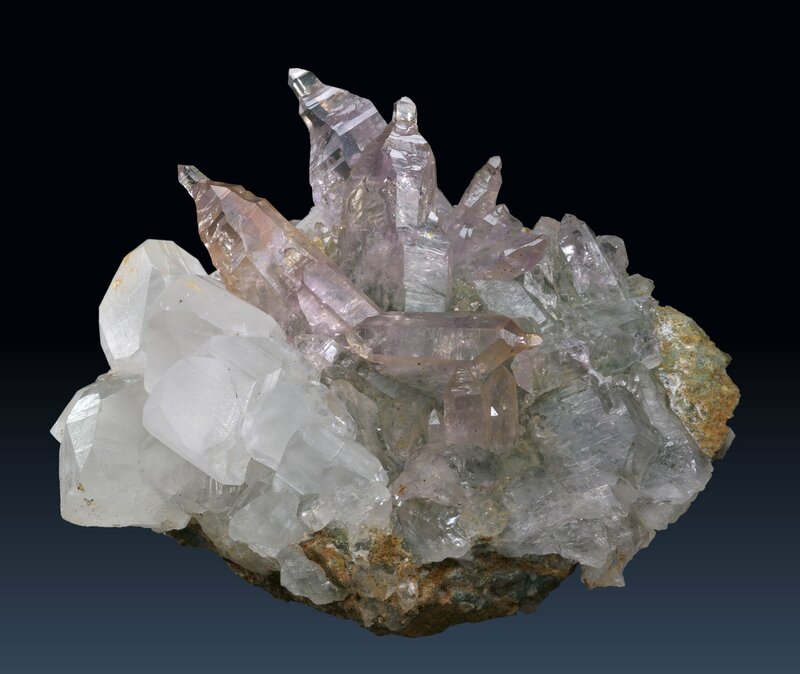 All parts of the specimen grew under the same environmental conditions, so if that is true, the crystal should be higher than wide, but it is not. The reason is the conchoidal fracture of quartz. Quartz will not form a plane surface parallel to the prism faces when it cracks, it will form an irregular, conchoidal surface, like glass. Such a surface is thermodynamically very instable and will grow very quickly in a saturated solution, much quicker than any other crystal face. You can tell how quick it grows by how thin the faden is: its width reflects the dimensions of the faden quartz during the widening of the crack. So quartz inherently has a greater tendency to form "fadens" than most other minerals: The cycle of rupturing and healing is made possible by the quick growth of the conchoidal fracture surface. We can now also say something about the conditions of faden quartz formation. The quick growth on the fracture surface will only occur for a short time, until the irregular surface has been flattened out and turned into a more stable and slow growing crystal face. If the widening of the crack in the rock took place in a few large steps (for example, caused by earth quakes), the crystal would have been split and the parts separated so much that they would not get in touch again within the short phase of quick growth. The healed surfaces would grow much slower and the two newly formed crystals would develop a normal habit. If they came in touch again later and perhaps crack again, there would only be two well separated cracking scars inside the crystal, not a thread. The fact that it is a thin line shows that the widening of the cleft in the host rock was a more or less continuous movement. This, of course, is all very much an idealized picture of what is going on during faden quartz formation. Faden quartz is a typical product of alpine-type fissures, because two essential conditions of faden quartz formation are often met in that environment: the fissure in the host rock opens slowly and continuously, and the crystal growth starts immediately after the initial crack formation and continues for a long time. 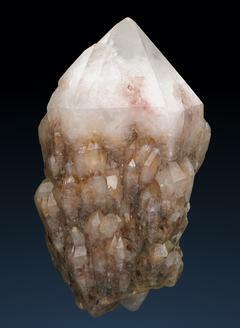 Lots of faden quartzes come from the Waziristan province in Pakistan, like this crystal cluster. A milky faden runs vertically through the largest, platy crystal. Another typical platy faden quartz, also from the Waziristan province in Pakistan. The thin faden in it describes an arc, because both rock walls the crystal was attached to were also displaced horizontally with respect to each other during the widening of the cleft. 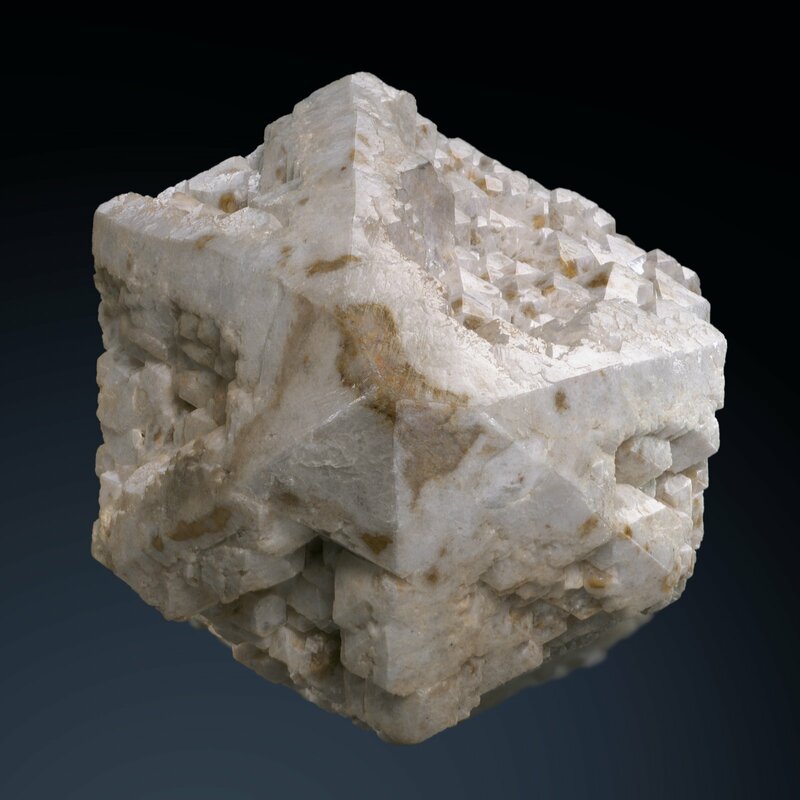 Faden quartz crystals do not necessarily start as crystals that are oriented parallel to the walls of the opening cleft, so a faden can run through a crystal in any crystallographic direction. If it runs parallel to the c-axis the crystals do not assume a platy look because the direction of the rapid growth during the healing of the crack is the same as the direction of the fastest growth during normal development. The faden describes a slightly irregular path. That does not necessarily mean that the opposite walls of the cleft were going on a zig-zag path. The thin crystal aggregate that spans the cleft can crack at slightly different positions. In this crystal the faden is very well visible because of dark inclusions of mica schist at the back side of the crystal. 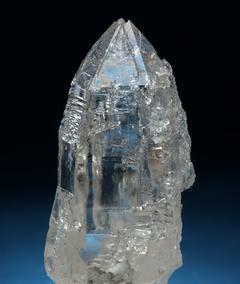 The crystal is from the Piz Beverin mountain, Graubünden, Switzerland. 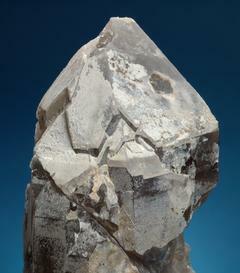 This is a so called Messerquarz ("knife quartz") from the famous lead/zinc mine of Ramsbeck in the Sauerland, Germany. As you can see, these are actually platy faden quartzes. This specimen consists of 3 intergrown faden quartzes. The "individuals" can be identified by the different angles the crystals grew in. The "thread" on the left side is easy to spot, while the central and right ones are partially covered by prismatic crystals in the foreground that grew independently. As one would expect, all "threads" run in the same direction. 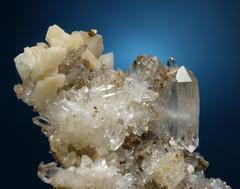 The yellow crystals at the base of the specimen are dolomite. These are two images of another Messerquarz specimen from the Dörnberg mine at Ramsbeck: a faden quartz still attached to the rock, rhombohedric dolomite crystals, golden chalcopyrite, and rock crystals. The thread is well visible and runs horizontally through the parallel-grown faden quartz crystals. The specimen is interesting because you can see how the faden got wider in time. This faden quartz specimen demonstrates very nicely how much the speed of growth differs in different crystallographic directions. It consists of two adjacent faden quartzes, whose c-axes are roughly perpendicular to one another. The left crystal shows a normal habit, while the right one is platy. The specimen is from Piz Beverin mountain, Graubünden, Switzerland. If both crystals had been attached to both walls for the same time, their fadens would be equally high. The right one is lower so it must have lost contact to one wall much earlier, and we can estimate from the length of the fadens in both crystals that it got detached at about half-time of faden growth. Why did the right crystal loose contact and not the left one? Because the speed of growth in quartz is higher along the c-axis. Very likely the widening of the cleft was gaining speed and outpaced the speed of growth in the right crystal. The left crystal could keep up with the diverging walls for a much longer time. 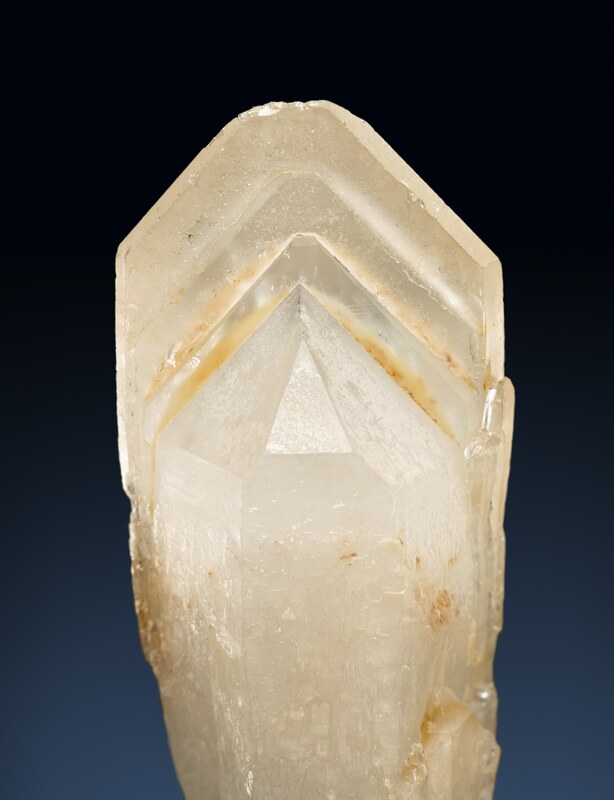 Also note that the faden in the right crystal ends much closer to the upper edge of the crystal than in the left crystal, although it got detached from the wall much earlier and had more time to continue growth as a "normal" quartz. So it grew mostly along its c-axis and got very wide. The faden in the left crystal is not continuous. It would appear that at some time during the development of the crystal one of the walls made a sudden move sideways, and at first it looks as if the faden we see in the crystal broke itself. 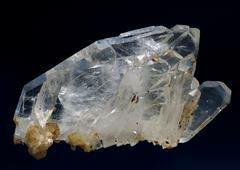 But this is unlikely: in a faden quartz that is only connected to the host rock on one side, the youngest part of the faden is usually its open end (in this case its upper end). Thus the displaced upper part of the faden has probably developed after the rupture. This is supported by the fact that the thickness of the faden changes suddenly at the rupture, it got wider. So what probably happened is this: the upper part of the developing faden (the part that later moved away with the upper wall and which has now disappeared) was shifted sideways. Both ends grew together again and when the vertical widening of the cleft resumed, the faden cracked at a different position. Faden quartz crystals not only often assume a flat habit, but also frequently get distorted, in particular if the faden does not run parallel to one of the a- or c-axes. This involves the cross section of the crystals, as demonstrated in this crystal. The side view in the first image shows an apparently skewed prism, but this is only caused by large rhombohedral faces at opposite ends of the crystal. The second image shows the same specimen viewed top down. I had to turn the specimen by 180° to get good illumination: The group of bright horizontal crystals that was right of the center of the previous image is now on the left side. The long faden quartz crystal is now to the right. 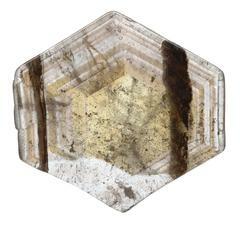 Though the cross section of the faden quartz crystal is still six-sided, its looks much like a rhomb. The specimen is from Kuar Valley in Afghanistan. 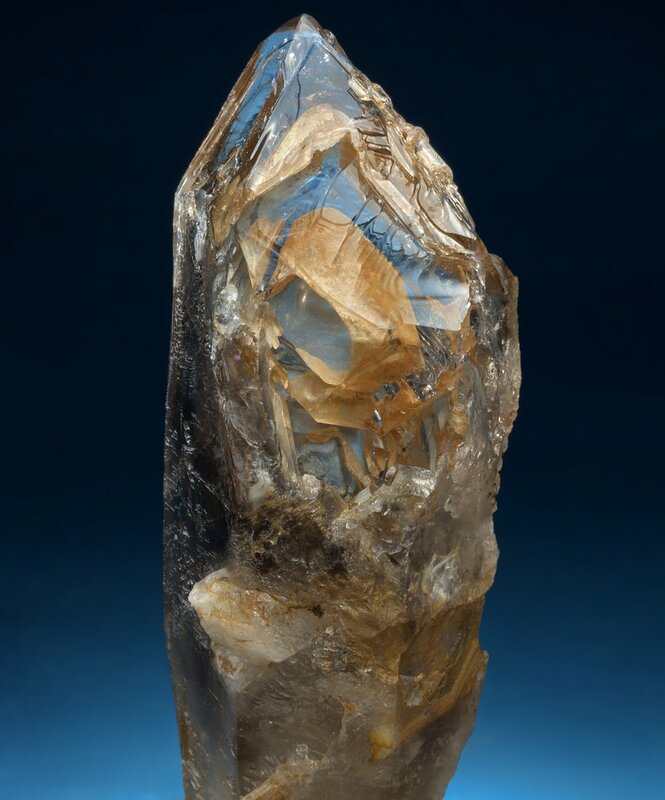 Although it looks very different from the prototype, this double terminated rock crystal is a faden quartz from Mont Chaz Dura near the Piccolo San Bernardo pass in the Italian Alps (Val D'Aosta). 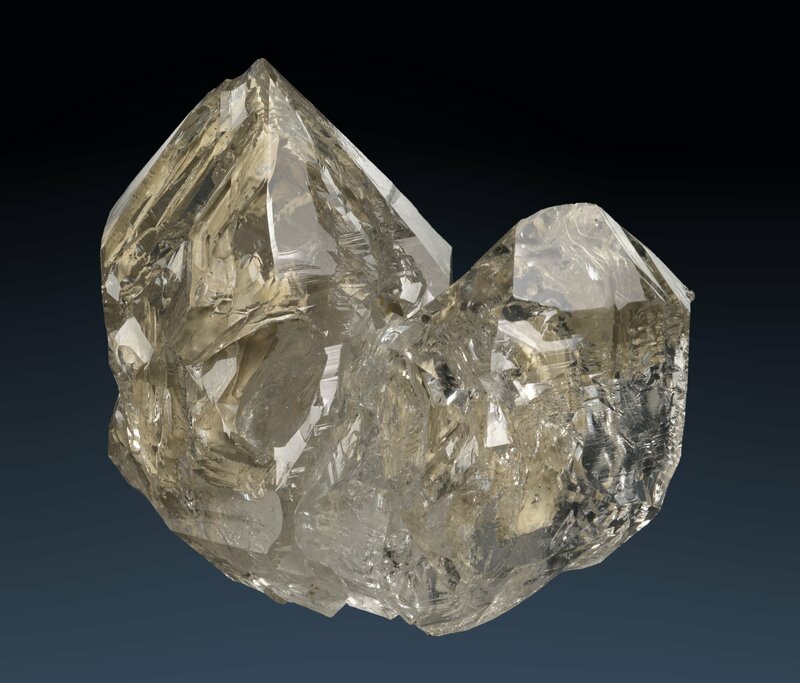 At the western Erongo Mountains and the nearby Klein Spitzkoppe mountain in Namibia, strangely intergrown double-terminated quartz crystals can be found. They form a dense three-dimensional lattice of crystals, and the German name "Gitterquarz" ("fence" or "lattice" quartz) is chosen because the specimen look a bit like a garden lattice fence. The crystals appear to be twinned after the Japan law, as they intersect at angles around 85°. This, however, is not so, and the geometry is caused by an epitactical intergrowth with feldspar crystals that later have been dissolved in part or completely. The resemblance to Japanese twins is almost perfect, and even experts have fallen for it. But if you closely inspect a specimen you will find the angles to be rarely quite right and the prism faces also rarely to be in parallel, as they are in a Japanese twin. The paragenesis of the Gitterquarz locality has been described in Schnaitmann et al., 2009. The specimen to the right is a Gitterquarz from the western Erongo Mountains. The resemblance to Japan law twins is striking. The smaller crystals to the right form an irregular haystack-like aggregate within a matrix of needles of dark green schörl tourmaline. 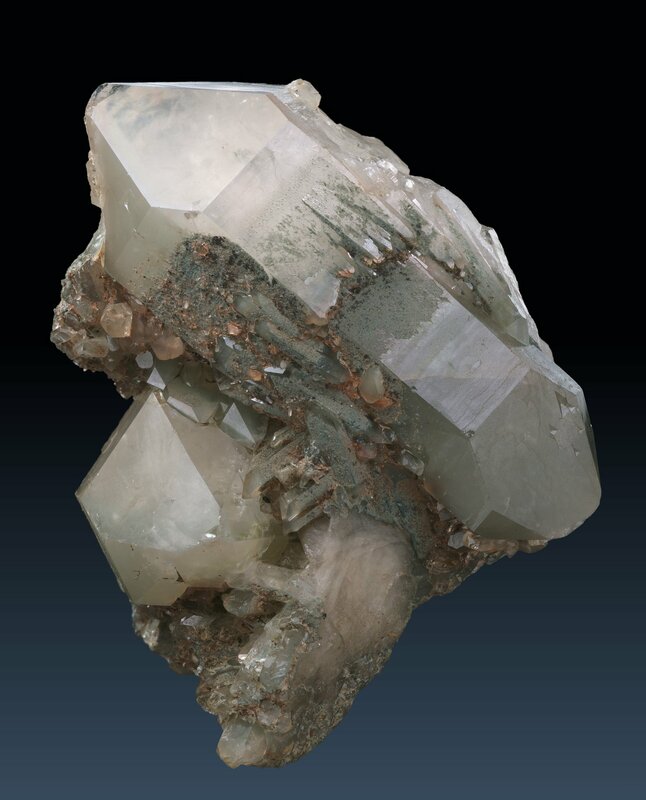 The same mineral is included inside the crystals and causes their gray-green color and their rough crystal faces. The next two images of a Gitterquarz specimen demonstrate the epitaxy of quartz and feldspar. Parallel smoky quartz crystals grew out of the crystal faces of an orthoclase crystal apparently twinned after the Baveno Law, primarily along the edges. On top are irregular crusts of hyalite opal, a secondary formation. Parts of the opal crust has been removed to reveal more of the epitactical intergrowth. The orthoclase is partially corroded and has a roughened surface with many small crevices which run parallel to the quartz crystals c-axis. 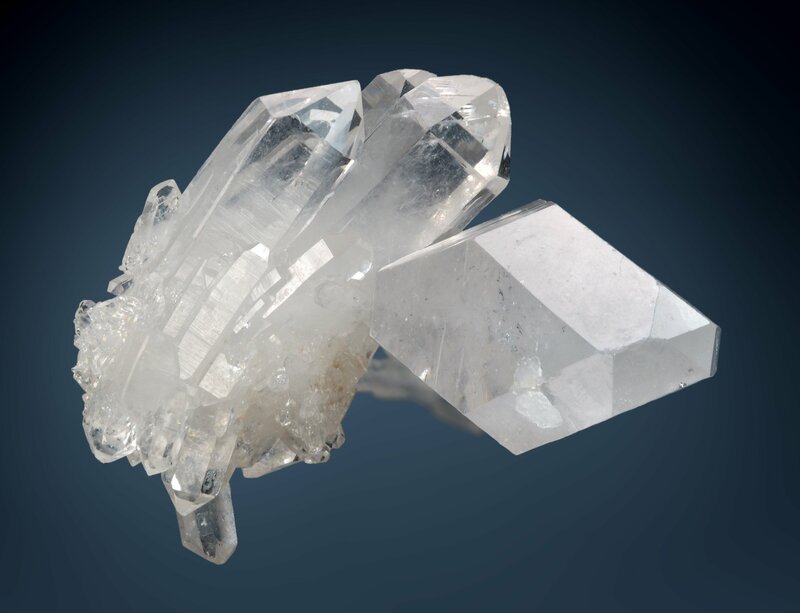 Had the orthoclase been completely dissolved, the result would have been a puzzling three-dimensional regular fabric of quartz crystals similar to the one in the first specimen above. 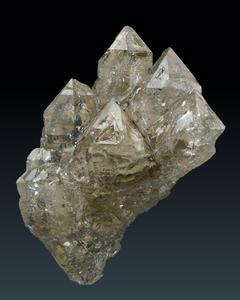 Since the orthoclase is twinned, the orientation of c-axis of the quartz crystals on the left side differs from those on the right side, but their m-faces are still parallel to each other. The second image is a view of the same crystal from the bottom, along the c-axis of the orthoclase, showing its diamond-shaped cross section. It is easy to imagine what the intergrowth of the crystals would look like if the feldspar was removed. From the Western Erongo, possibly the "Diesel Pocket" at the border of the Bergsig 167 farm and Erongorus 167 farm, Karibib, Namibia. The section has been moved into a separate page, listed under "Special Topics": Gwindel. Mullis and Sigl (1982) describe such hollow quartz crystals and aggregates of these quartzes they found in a trachyte from the west coast of Gran Canaria, Spain. The authors speculate that they form in boiling watery solutions and that the crystals grew around bubbles attached to the crystal tips. This view is supported by the finding of crystals whose tips were completed again and in which the cavity was sealed. Such cavities were found to contain water vapor. It is nevertheless not clear if growth inhibition by vapor bubbles is the general mechanism behind the formation of these and similar crystals: some of the hollow crystals get fairly large and have an internal diameter of one centimeter but are just one centimeter high. It is difficult to see how a small crystal "grows its way around" a large bubble - the fastest growth occurs parallel to the c-axis, so a crystal that encloses a large bubble must already have a diameter that is close to that of the bubble. This specimen is from the Opal Hill Mine at Palo Verde, Imperial County, California. This spot is one of the few fire agate localities (fire agate is presented in the chalcedony subsection), but you can also find chalcedony roses. In the upper half of the specimen you see a small aggregate of six-sided hollow crystals inside such a chalcedony rose. A close-up of the honeycomb-like crystal aggregate shown in the previous image. This is the only specimen I have where several hexagons form a structure not unlike a small wasp nest. 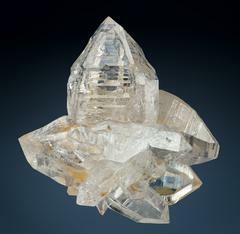 Note that the crystals outer shape is clearly hexagonal like an ordinary quartz crystal prism, but the internal walls are rounded. This image shows a cavity in a volcanic host rock that is outlined by irregularly intergrown crystals. The larger ones assumed a cup-like shape, like the big one in the center of the image with an internal diameter of about 1 cm. On its left side there is another "cup" in which smaller crystals started to grow from the ground of the cup and form multiple terminations. From Tillie Hall Peak, Mule Creek, Graham County, New Mexico. Two hollow crystals on the specimen shown in the previous image (but not visible on that photo). By a lucky coincidence the right crystal has been split parallel to the c-axis so the hollow tube can be seen framed by the shiny fracture surfaces left and right to it. There is a "plug" in the tube with a small crystal tip on top of it (pixel coordinates 1805,1284, counting from the upper left corner at camera resolution) and another one at its bottom (pixel coordinates 1937,2148). The lower end of the cavity is marked by black dots of an unknown mineral (possibly iron or manganese oxides). The left crystal is mostly intact, only at its base (around the pixel coordinates 1316,2032) there is a little hole and one can look into the cavity. In both cases the cavity reaches the base of the crystals, it is not just a shallow dent, and the diameter of the cavity amounts to about 30-60% of the external diameter of the crystal. 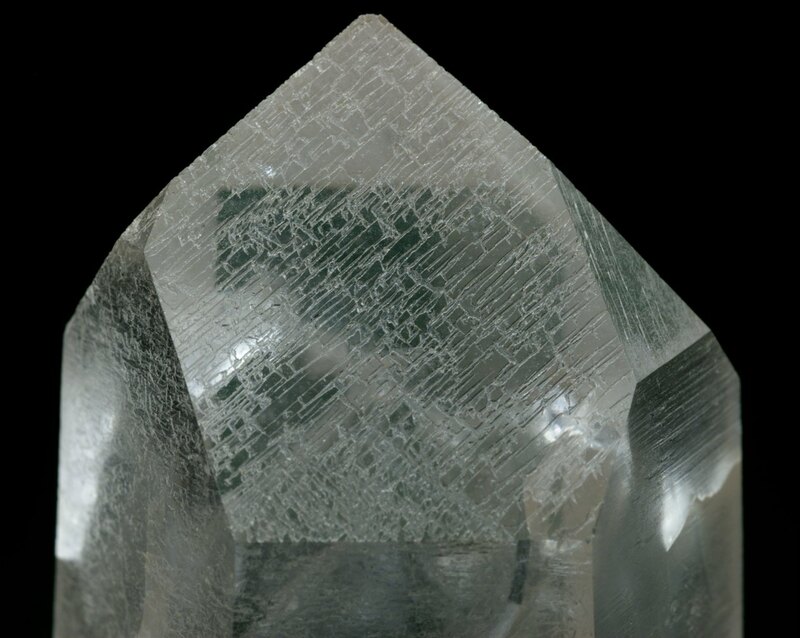 Note the peculiar surface pattern on its prism faces, resulting from several layers that have been deposited on the crystal. 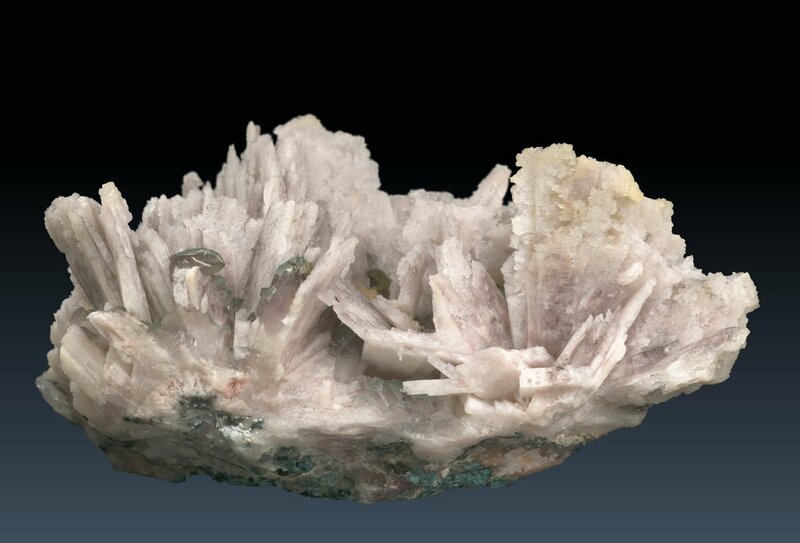 This is another specimen from the Opal Hill mine, with a group of hollow crystals radiating from a point in the bottom right corner of the image. The hollow crystal in the center that points to the top left corner shows a scepter-like overgrowth of the prism: a group of three small crystal tips points in the opposite direction. A similar scepter-like growth pattern is present in the neighboring crystals, albeit it is more difficult to see. 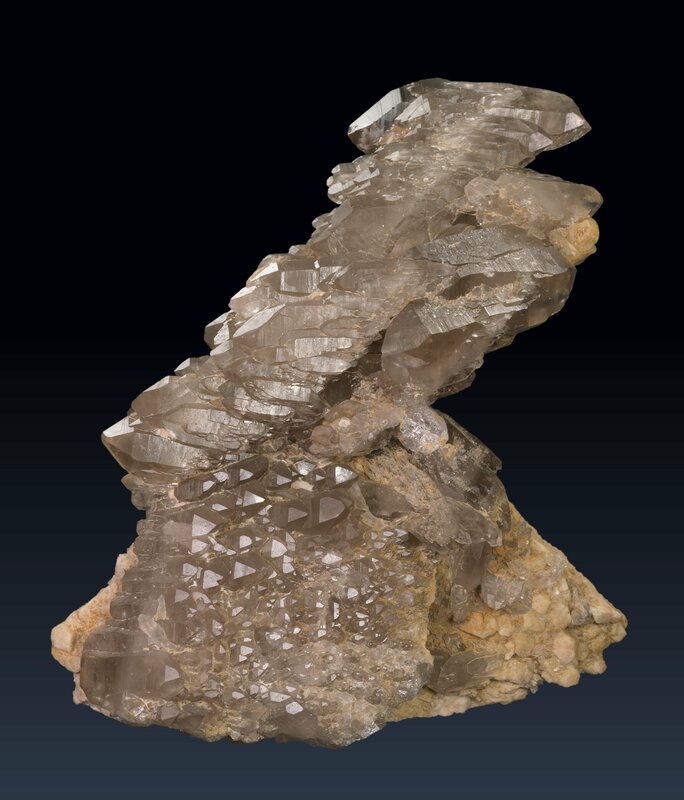 The scepter-like overgrowth of the prism is also found in crystals from Tillie Hall Peak, the Mopah Range and in the locality on Gran Canaria, so it seems to be typical of such hollow crystals. 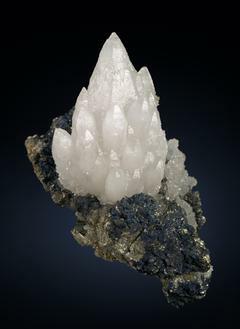 The crystal above the one in the center is partially overgrown by dull translucent chalcedony, which has also reported for Gran Canaria specimen. 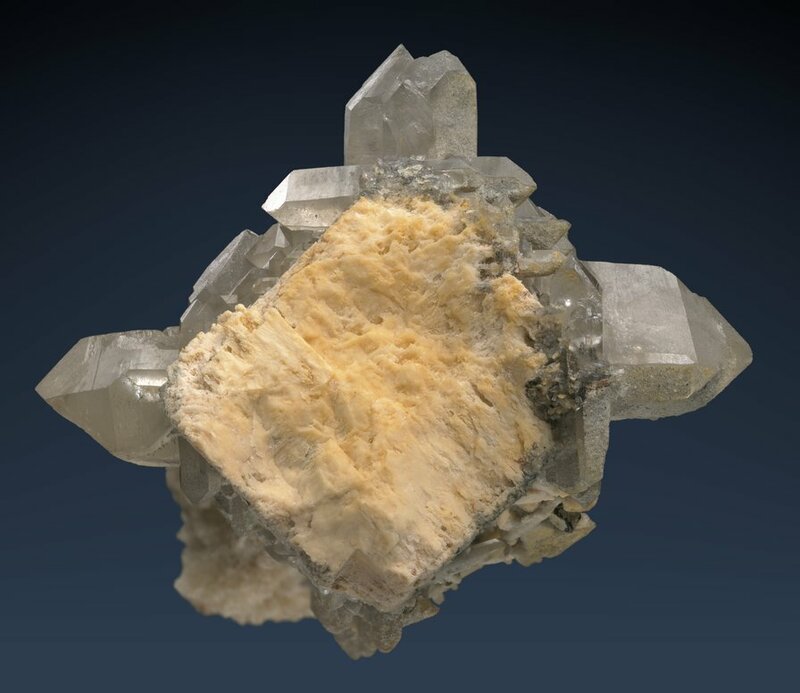 Growth inhibition in quartz is usually associated with crystals of other minerals that got in the way of a growing crystal and were later dissolved, but the most common case is that of crystals that were literally running out of space during growth. 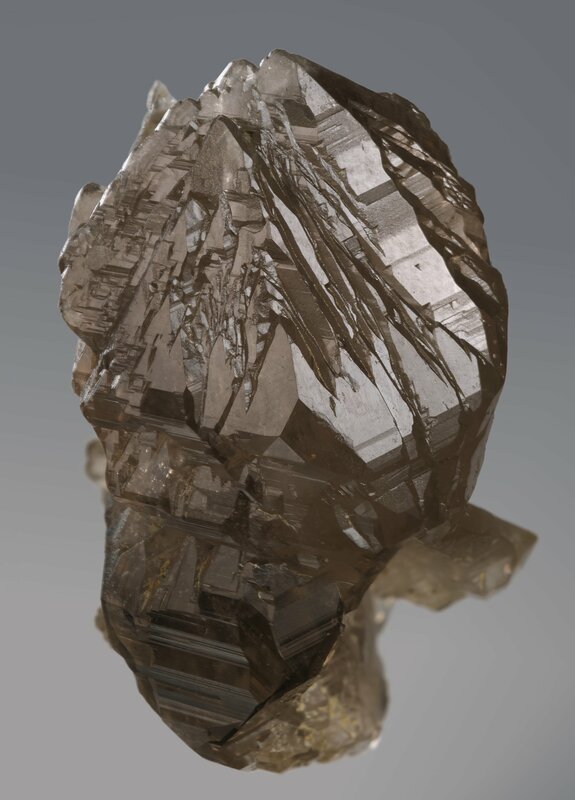 This specimen of shiny smoky quartz includes three crystals that were growing into the opposite wall of an alpine-type fissure. Their ends are covered with adular feldspar and chlorite, the same minerals that form the base of the specimen. From the upper Val Giuv valley, Tujetsch, Graubünden, Switzerland. This smoky quartz has an interesting pattern on the right side of its frontal prism face. There are three dents that neighboring rocks or crystals have left when the entire pocket got deformed during tectonic activity. This happened at the end of the crystal's growth phase and the mechanical stress exerted on those spots caused the formation of a peculiar surface pattern of roughly circular walls around the dents. The crystal is from Peterson Mountain, Sierra County, at the California-Nevada border, a tectonically still very active area. This double-terminated clear crystal shows many imprints of crystals that have later been dissolved. Judging from the shape of the indentations, these crystals have very likely been calcite, siderite, or dolomite, which all are carbonates that easily get dissolved upon changes in temperature, acidity or CO2 concentration. The indentations have later been filled with green chlorite. From an alpine-type fissure close to the Fieschergletscher (Fiescher Glacier), Wallis, Switzerland. 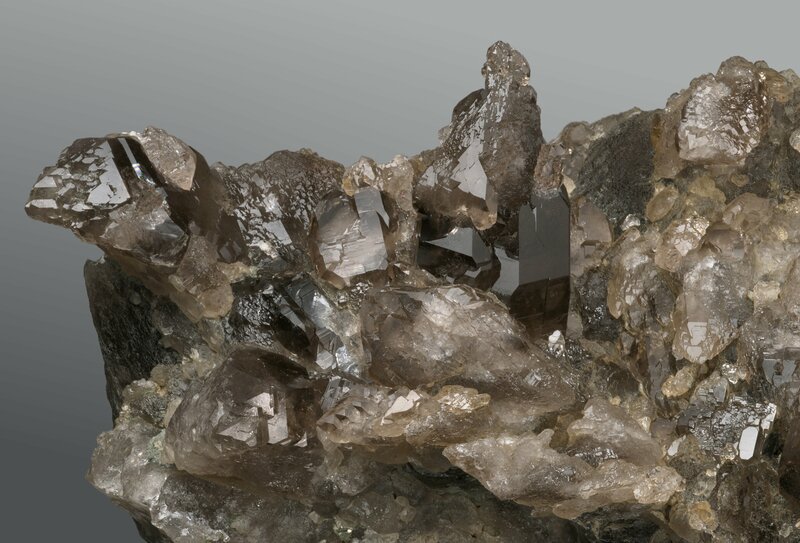 An unknown mineral, possibly chlorite, has caused the growth inhibition seen in these smoky quartz crystals. 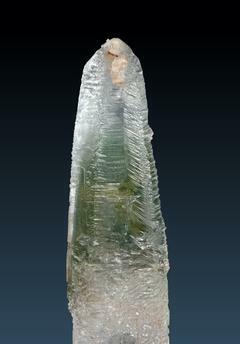 The chlorite is visible as an icing on the crystals, but the interior is perfectly clear. Chlorite has a tendency to attach primarily to the rhombohedral (r and z) and trapezohedral (x) faces of quartz crystals. Accordingly, the prism faces (m) are largely uneffected and just look a bit dull, while the rhombohedral faces show a very strange surface. They are covered with many small parallely grown crystal tips that stand out above the larger rhombohedral faces. Interestingly, they all grew up to the same level, as can be seen in the upper left edge of the left crystal and the right edge of the right crystal in the second close-up photo. Since the crystals were found completely embedded in chlorite, it also possible that some mineral present in irregular patches within the pocket clay has caused a transitional inhibition on parts of the rhombohedral faces. It is very difficult to say anything with certainty post hoc, however. This is a possible precursor of an unnamed growth form shown below. From the upper Val Giuv, Tujetsch, Graubünden, Switzerland. These slightly smoky rock crystals carry many parallel grooves, mostly on their rhombohedral faces and only a few on the prism faces. This suggests that the surface pattern is caused by a strange mode of growth. But the grooves are in fact scars caused by a mineral that got dissolved. One can tell because the direction of the grooves does not correlate with a crystallographical axis or the orientation of the crystals, and the grooves line up with grooves of neighboring crystals that have a different orientation, as can be seen on the two neighboring crystals in the lower right corner. Which mineral once filled the grooves is hard to say; platy calcite is very common in the Alpine-type fissures these crystals came from. 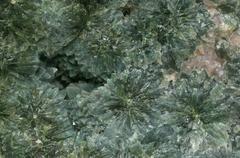 But some of the grooves are slightly bent, so a fibrous mineral like actinolite or rutile is a better candidate. 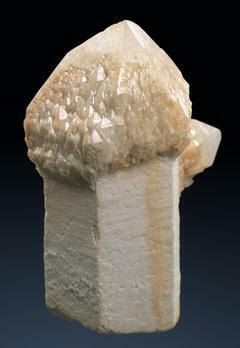 Amphiboles and rutile do not dissolve easily once formed, but anhydrite does and also forms elongated crystals, and it is more soluble at low than at high temperatures, so these grooves have probably been formed by anhydrite needles that grew in the fissure in the latest phase of quartz crystal growth. This would also explain that the grooves are rather shallow and mainly visible on fast growing rhombohedral and not the prism faces. From the Grimsel area, Berner Oberland, Switzerland. The following three photos show different views of a very odd crystal from Itremo, Magagascar. 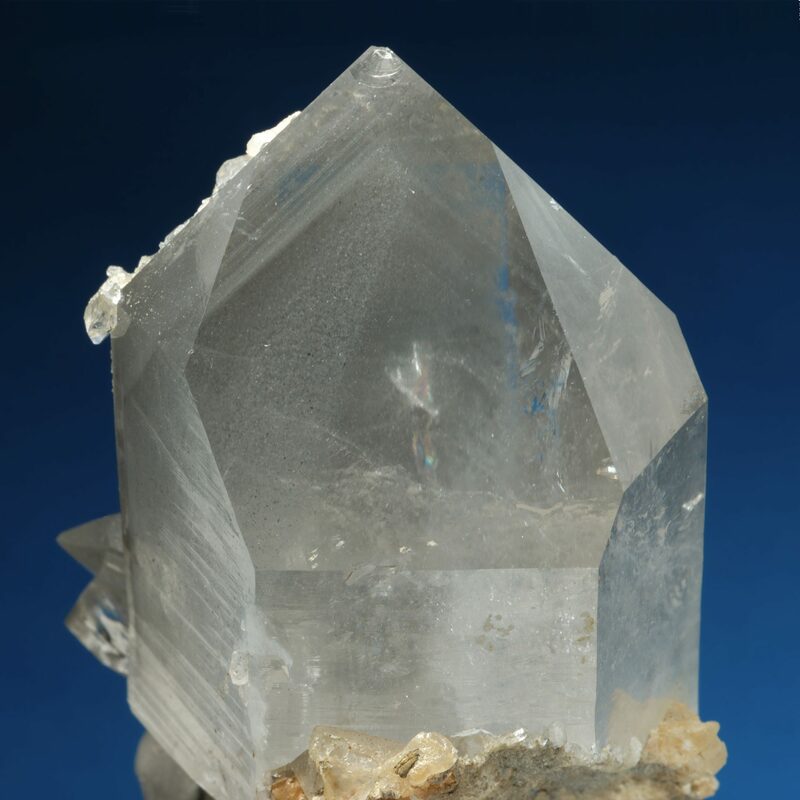 It's a typical Itremo milky quartz with split growth on the prism faces, but one half of the crystal tip seems to be cut away. Interestingly, the cut is exactly parallel to one of the a-axes. No clues are left on the crystal as to what caused this, but the zones that are visible on the larger half (see last photo) perfectly match the outline of the smaller half. It is likely that the tip was covered by an growth-inhibiting material on the now smaller half of the crystal - this would work if the crystal was oriented horizontally during growth, with the growth-inhibited parts on the top. Later the material got dissolved and the growth resumed. There are no traces of inclusions visible inside the crystal as phantoms, and there are no indentations left on the surface of the crystal, so a period growth inhibition of the crystal is plausible, but unproven. 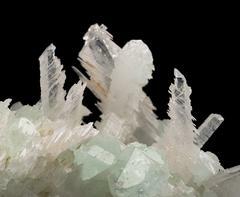 Growth-inhibited quartz crystals that look like stacks of coins, and pale green datolite crystals. The shape of the quartz crystals is caused by thin calcite plates that started to grow a bit later than the quartz crystals and later got dissolved. Collection Witold Góral. This section has been moved to the Crystal Habits page. There are no canonical rules and one can just as well call needle quartz a growth form, but there are other habits like the Cumberland habit which are also defined by the relative elongation of the crystals, so it seems more appropriate to treat needle quartz as a habit. 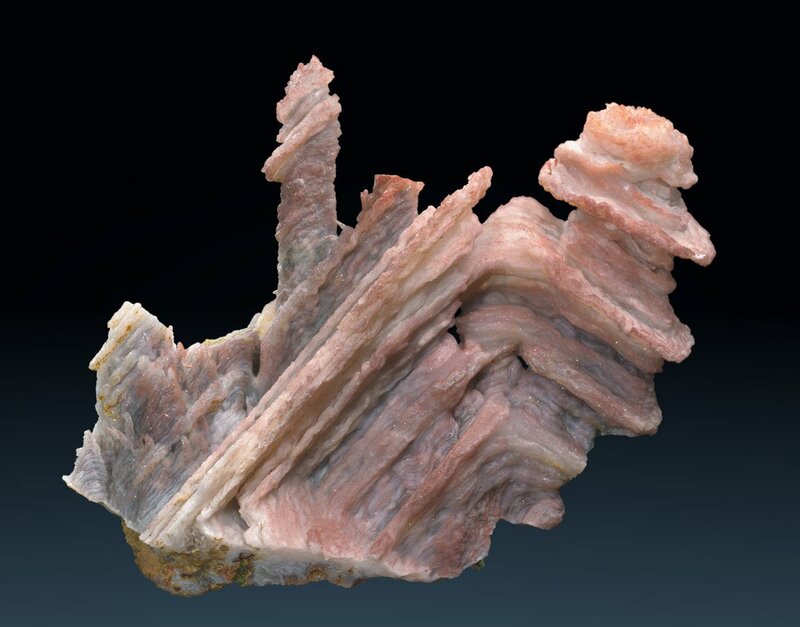 When a mineral overgrows another mineral that is dissolved later, the older mineral's shape is preserved as a cast, and this is called a perimorphosis. Just as for pseudomorphs, the correct expression is "a younger minerals perimporph after the older mineral". 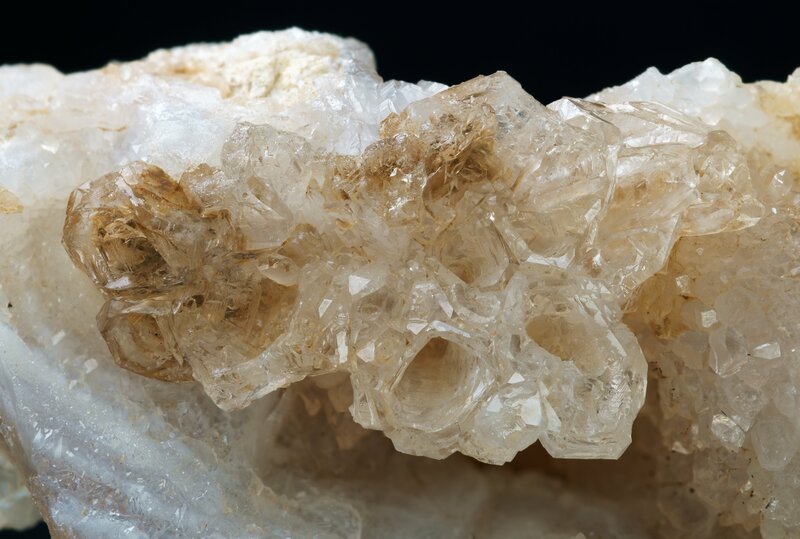 Quartz perimorphs after carbonates and sulfates, like calcite and baryte, are common in hydrothermal veins, but often it is difficult to determine the older mineral with certainty. 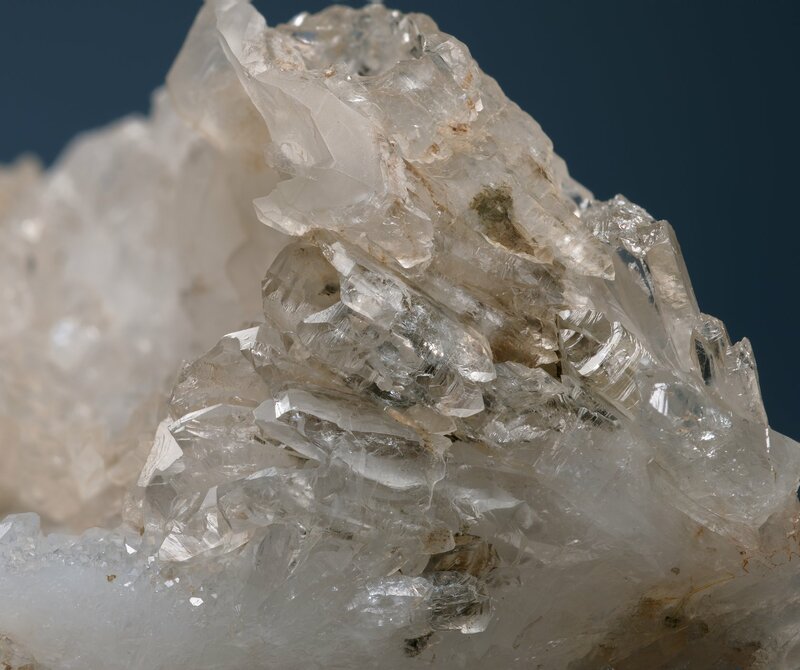 Once quartz has formed, it is usually more difficult to dissolve than most other minerals, so a mineral's perimorph after quartz are much rarer. 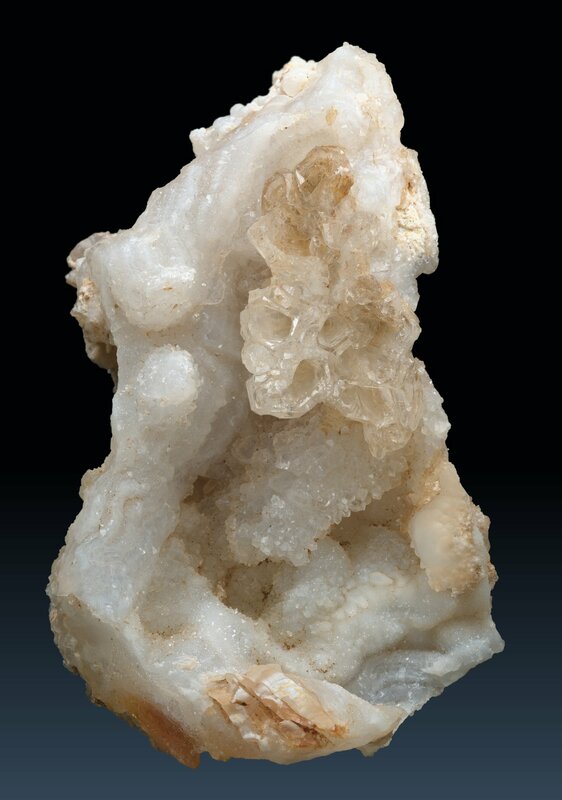 Although this looks a bit like chalcedony covered by small quartz crystals, it is a perimorphosis of quartz after calcite. Platy calcite crystals in a gangue have first been surrounded by quartz. The surface has been encrusted by small quartz crystals. The calcite has later been dissolved. 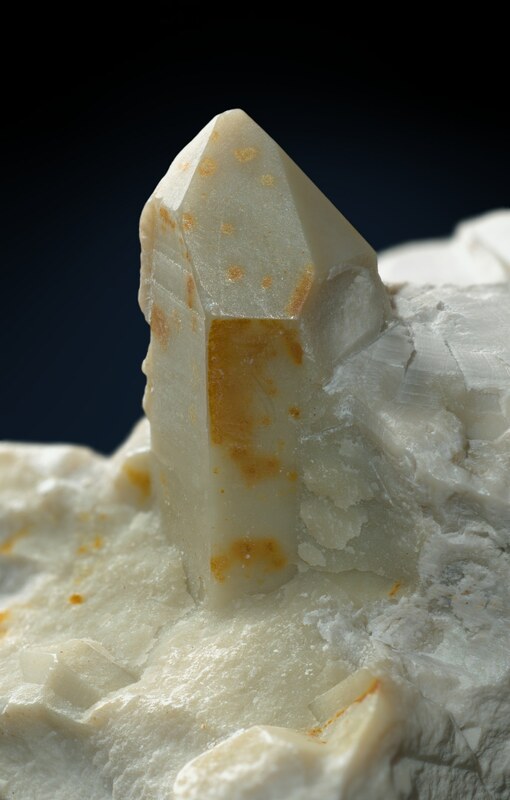 The small yellow rhombohedral crystals are calcite. The specimen is from Herbornseelbach, Hessen, in Germany. A rock crystal sits on platy quartz perimorph after an unknown mineral. What is left are hollow plates enclosed by small sparkling quartz crystals. Judging from their shape of the plates this could be a perimorph after platy calcite. From the Gobobseb Mountains, Namibia. 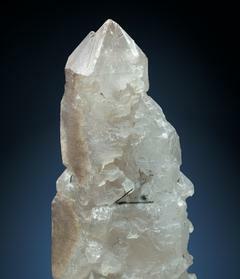 Quartz crystals have encrusted pointy scalenohedral calcite crystals that have partially been dissolved. 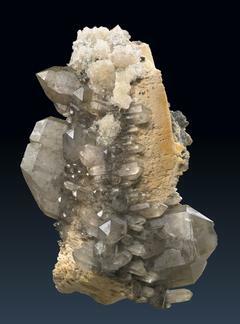 The specimen comes from a hydrothermal calcite vein in the Bleiwäsche quarry at Wünnenberg north of Brilon, Sauerland, Germany. Despite its rippled and rounded surface structure that is typical for chalcedony, the straight edges and right angles reveal that this specimen is a chalcedony perimorph after a mineral that crystallized as large cubes, most likely fluorite that got dissolved completely. It is interesting that the perimorph is not made of a single, but several nested, more or less complete casts. From Sidi Rahhal, El Kelaâ des Sraghna Province, Marrakech-Tensift-El Haouz region in Morocco. Another, much larger chalcedony perimorph from Sidi Rahhal, seen at the Hamburg Mineral Fair 2008. Here the cubic shape of the dissolved mineral is obvious. 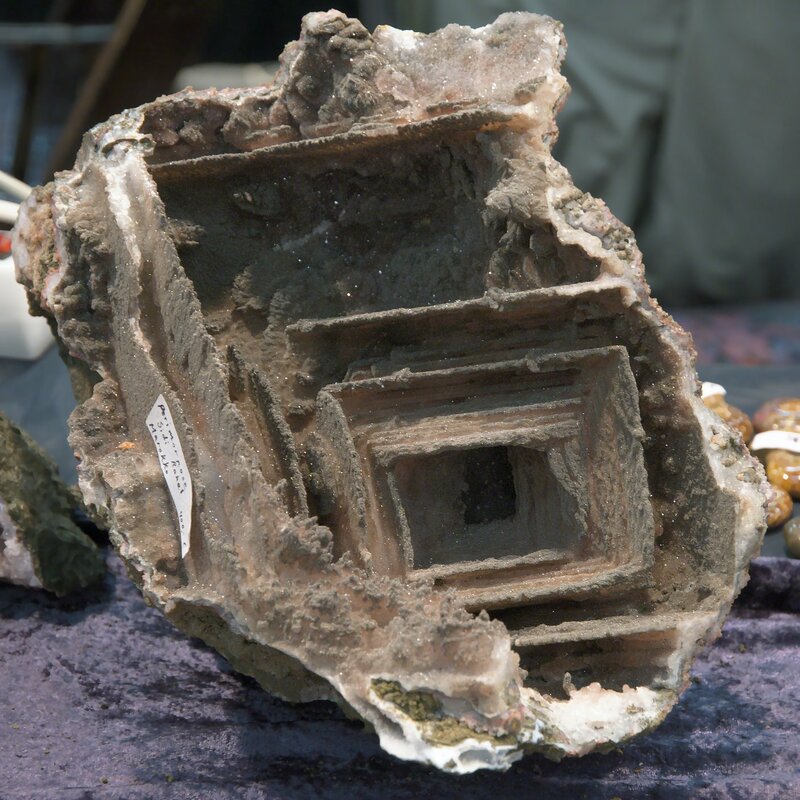 A similar specimen from Morocco that is encrusted with sparkling amethyst is shown on the Tuscon Mineral Fair 2009 poster. An outline of the shape of a smaller crystal that is visible inside a crystal is called a ghost or a phantom. Minerals have precipitated on the crystal for a short time during crystal growth and have later been embedded in the growing crystal. If minerals precipitate several times during growth, one can see several stacked phantoms, much like Russian Matroska puppets. The phantom is often very faint and ghost-like. This is the classical definition of a phantom. Growth conditions that led to the inclusion of colorizing trace elements or minerals have changed. It is not uncommon to find clear quartz with a milky quartz phantom. Other examples would be a smoky quartz phantom inside a colorless rock crystal, or thin zones of amethyst coloration that are parallel to the rhombohedral faces. 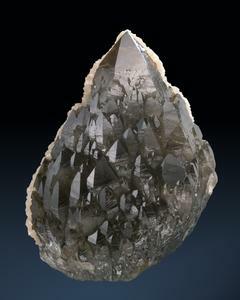 The first specimen represents almost an epitome of a "phantom quartz". 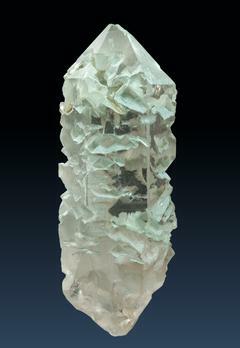 It is a slighly smoky crystal with a very nice phantom made of green vermicular chlorite. It is a remarkable piece because the phantom is "complete" and because the phantom reveals that the crystal's shape changed during growth. It is also presented in the Crystal Habits section. From Cerra Do Cabral, Minas Gerais, Brazil. 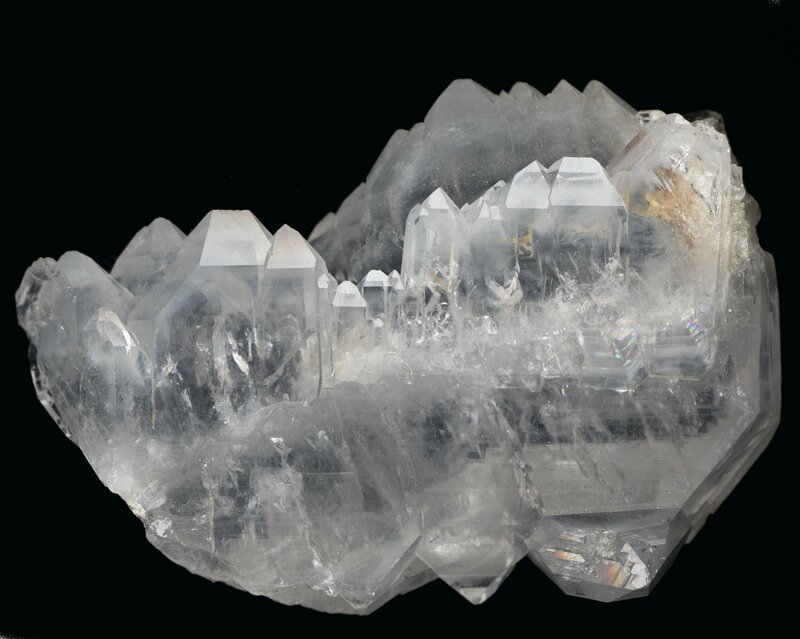 A rock crystal with multiple stacked phantoms caused by fine material that precipitated onto the growing crystal. In the upper left part one can see many fine lines that run parallel to the rhombohedral faces. Left to the center a thin layer of grainy pocket detritus covers a former rhombohedral face. The specimen is from Piz Beverin, Graubünden, Switzerland. 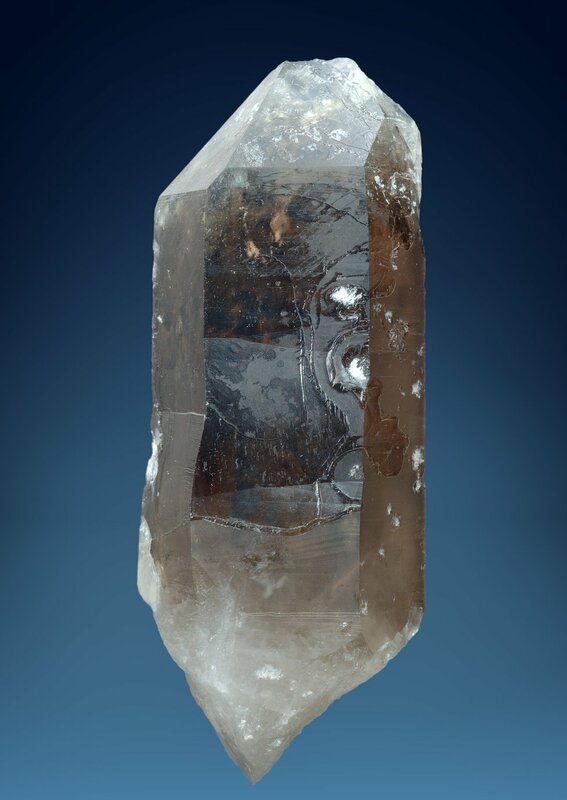 A small stubby quartz crystal with Tessin habit that includes multiple brown phantoms. 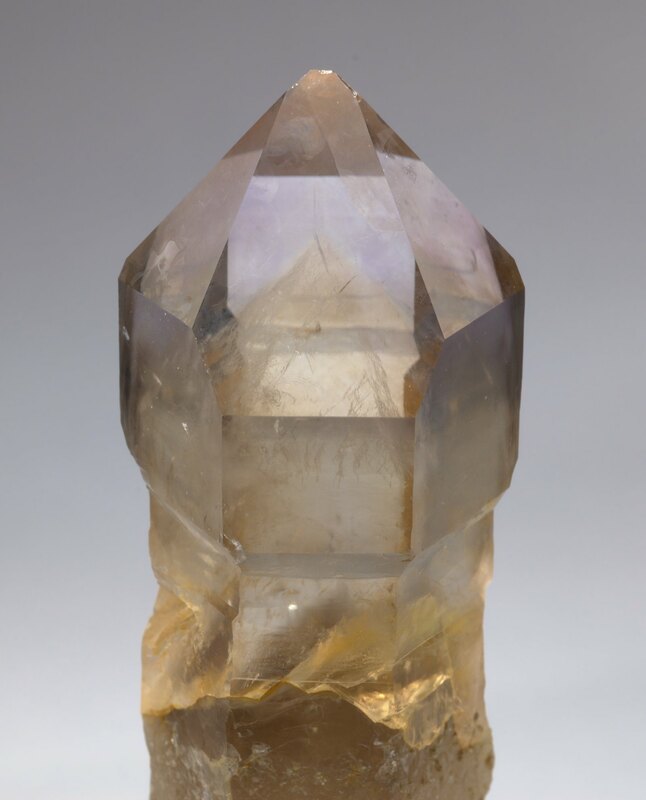 These clear phantoms are smoky quartz zones that reflect changes in the chemistry of the environment. 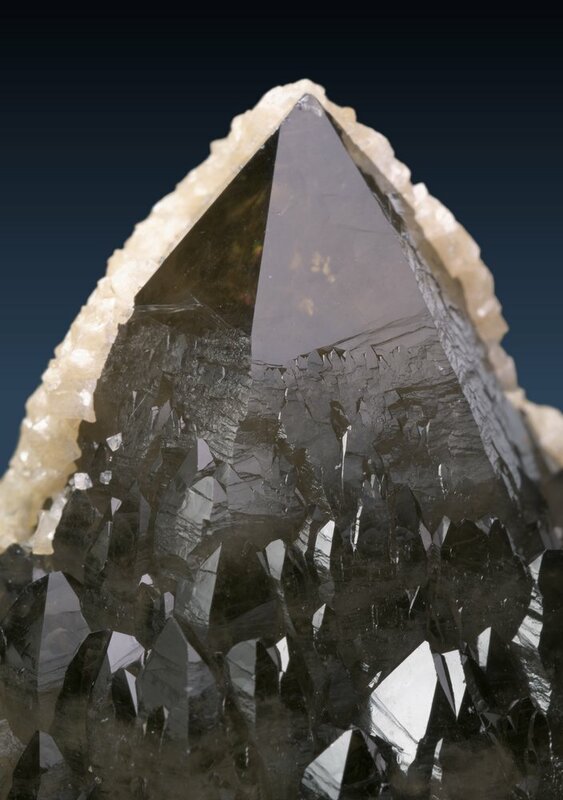 The black needles that radiate from the base of the crystal and cover parts of the crystal faces are schörl, a black, iron-rich tourmaline. From a granite miarole pocket in the western Erongo mountains, Namibia. This is a 3 mm thick slice of a quartz crystal prism (cut perpendicular to the c-axis, so the six sides correspond to the prism faces). 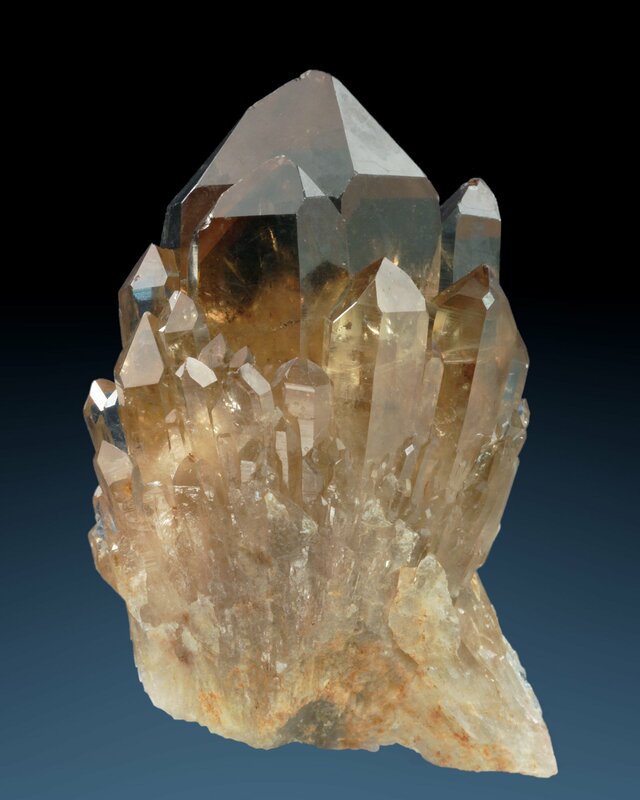 There is a central citrine core surrounded by alternating zones of rock crystal and smoky quartz. Most of the inclusions (both minerals and fluids) can be found along cracks in the crystal and in irregular patches, but some of them are also concentrated on lines parallel to the prism faces, for example at the upper right and the right edge. The dark vertical lines are large cracks in which various minerals precipitated. The lower colorless part of the crystal that lacks phantoms is actually a part of a neighboring crystal. From the Landsverk I mine at Evje, Aust-Adger, Norway. Amethyst phantoms are not uncommon, sometimes together with smoky phantoms, in elongated crystals from Namibia, Madagascar and Mexico. This crystal contains deeply violet but blurred phantoms in the lower part and sharp amethyst-smoky phantoms at the tip. The phantoms are all "complete" and are shaped just like a complete crystal tip, but because they are so thin they can only be seen when viewed along their edges. 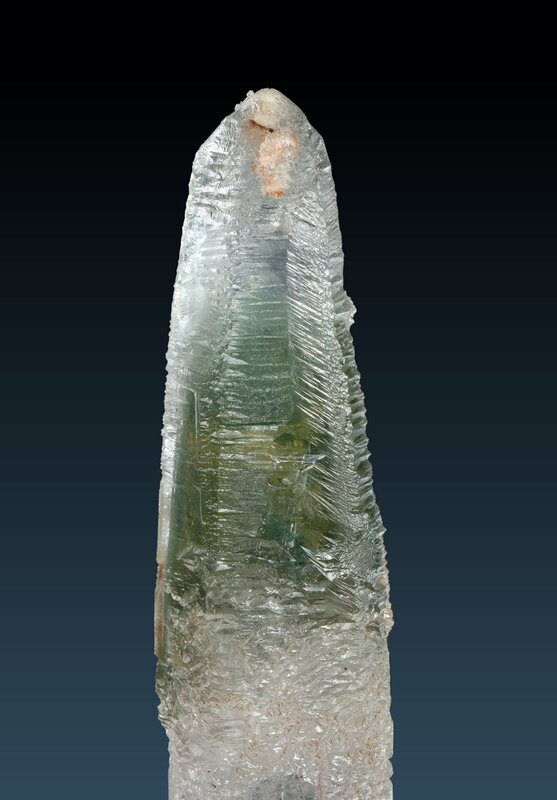 The crystal is from Ankazobe in Madagascar. 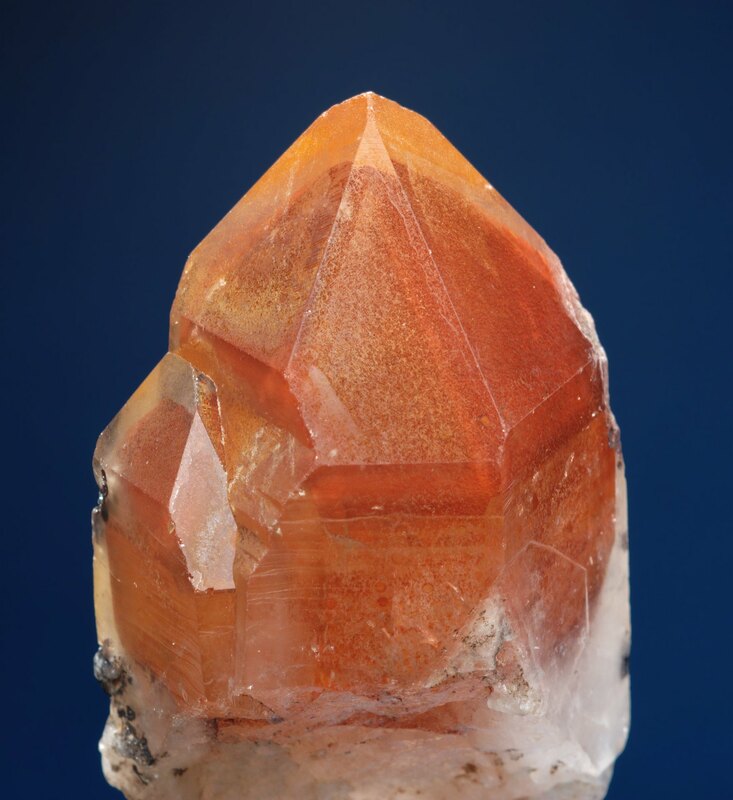 This image shows a ferruginous quartz containing an orange-red phantom made of hematite that precipitated on the crystal faces. The dark metallic spots at the left of the crystal are tiny hematite crystals, too. The specimen is from the Orange River in southern Namibia. A typical smoky quartz specimen from Usingen in the Taunus mountains, north-east of Frankfurt, Germany. The crystals lack prism faces (m-faces) and only show rhombohedral faces. All crystals show a zonar smoky color, forming multiple phantoms. While the look of phantoms caused by the inclusions of minerals can vary among the crystals from a single pocket, phantoms caused by the zonar distribution of color centers (as found in smoky quartz, amethyst, and citrine) show the same pattern in all crystals, as color center formation depends on environmental conditions like the presence and absence of certain elements in the fluids. Multiple phantoms made of stacks of fine layers of chlorite can be seen inside these rock crystals from Minas Gerais, Brazil. The phantoms all lie parallel to the backward rhombohedral faces. The phantoms stand out from this white background because the back sides of the clear and shiny crystals are covered with fine white pocket detritus. As one would expect, all crystals show a Dauphiné habit as this habit is promoted by material that precipitates on just one side of a crystals. In all well-formed crystal tips on this specimen the same pattern of phantoms can be found. Starting from the center of the crystal, there is a dense and dark phantom, followed by a large gap, two nearby groups of chlorite layers, a smaller gap, and finally several fine chlorite layers - all crystals were experiencing the same changes in environmental conditions, of course. 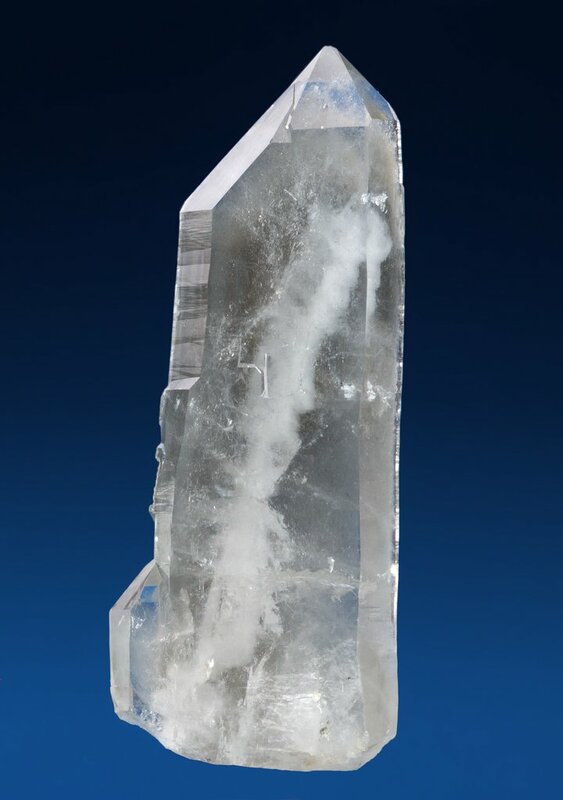 Often phantoms are hardly visible or they are poorly defined with diffuse borders made of fluid and gas inclusions, like in this interesting rock crystal. The clear tip grew on an older, more stubby crystal. Its phantom is just above the middle of the crystal. The growth did not continue evenly, instead it started at the tip and the crystal grew longer and the second-generation layers were "creeping down" the prism from the tip of the crystal. So one could argue whether this crystal could be called a scepter or not. From the Madem Lakkos Mines, Chalkidiki peninsula, Northern Greece. Collection Anastasios Tsinidis. When one mineral replaces another one but the shape of the former mineral is preserved, this is called a pseudomorphosis. A "malachite pseudomorph after azurite" is a malachite that has replaced the substance of an azurite crystal but preserved its external shape. The first is actually quartz, the latter is another mineral. The same wording is sometimes used to describe pseudomorphs after non-minerals, for example, a coral agate is said to be a "chalcedony pseudomorph after coral". Because quartz is more stable in a wide range of geological environments than most other minerals, pseudomorphs of other minerals after quartz are much rarer than pseudomorphs of quartz after another mineral. The latter is often made of chalcedony, not of massive quartz. According to the most common theory on its genesis, tiger's eye is a "quartz pseudomorph after crocidolite asbestos". This image shows a pseudomorph of quartz after selenite to the left and a selenite specimen (CaSO42H2O) in the well-known "gypsum rose" form to the right. The shape of the gypsum rose is well preserved in the pseudomorph, but luster and translucency are different. 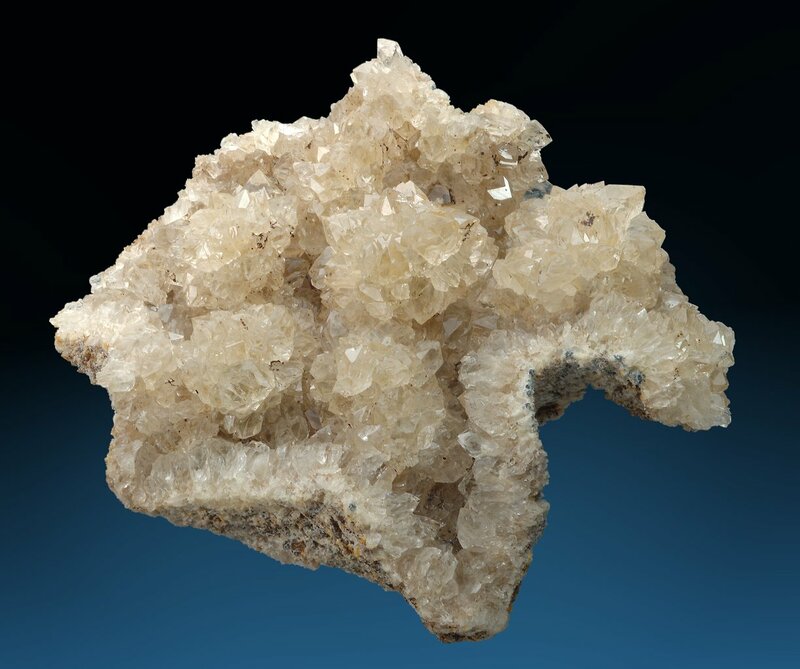 The quartz did grow as chalcedony, which is a much more common material in pseudomorphs of quartz after another mineral than grainy or massive quartz. The pseudomorph is from Crawford, Dawes County, Nebraska, U.S.A., and the gypsum rose from Touggout in Algeria. Pseudomorphs of chalcedony after anhydrite (CaSO4) are frequently found in fissures and geodes in volcanic rocks around Irai, Rio Grande do Sul, Brazil. The typical rectangular cleavage pattern of anhydrite can still be divined on the large fan-shaped blade in the right part of the specimen. To the left are some small dull quartz crystals that grew on top of the former anhydrite blades and are now covered by a thin layer of green chlorite and chalcedony. 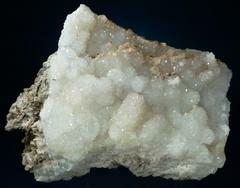 Pseudomorphs and perimorphs after anhydrite are quite common because the mineral is more soluble in cold than in hot water, so while the solution in a pocket cools anhydrite gets dissolved, other minerals assume its place. 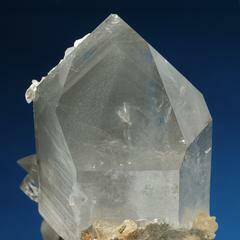 More often anhydrite will take up water and turn into selenite, however. A very unusual pseudomorph of andradite garnet after quartz. One can still see that small crystals were once sprouting from the main crystal, but the entire specimen is made of fine-grained and dull garnet substance. From Stanley Butte, Graham County, Arizona, U.S.A.
Pseudomorphoses of steatite after quartz were found in the Johanneszeche mine at Göpfersgrün, Wunsiedel, but also at a quarry near Thiersheim, both in the Fichtelgebirge mountains in Bavaria. The "crystals" are meticulously preserved and embedded in steatite masses, but - being made of steatite - they are very soft. A description of the localities (in German) is found at Berthold Weber's Mineralienseite: Thiersheim, Göpfersgrün. The specimen on the photo is from Göpfersgrün, donated by Jochen Mattis. There are two types of quartz crystals that are called rainbow or iris quartz. One is fairly common: Quartz crystals often show cracks running through them, usually caused by mechanical stress, and these sometimes show rainbow-colored reflections. Due to the conchoidal fracture of quartz the cracks are curved and the width of the fissure is not the same over the whole extent, but changes gradually. The cracks are usually very thin, and often just filled with air. Light that passes through the crack will get partially reflected on both walls of the crack. If the width of the crack is of the same order of magnitude as the wavelength of light, both reflected light beams will show interference colors: Parts of the spectrum will be canceled out, and the reflected light appears colorful. The color depends on the width of the crack and the angle at which the light passes the crack. As the width of the crack changes gradually, so does the color and this causes a rainbow-colored reflection. This effect is known as iridescence (hence the name iris quartz) and can also be observed when thin layers of oil swim on water. A nice example of an iris quartz with a large colorful and shiny blotch inside. From Dasoto, Kato Nevrokopi Basin, Drama prefecture, Greece. Collection Anastasios Tsinidis. The other type of iridescence is much rarer and has first been described by C.V. Raman in 1950. Here the cause of the color is not a crack, but interference by reflection and refraction on parallel twin planes, somewhat related to the effect seen in rainbow or iris agate. While in iris agate a grating made of parallel layers of different refractive indices are the cause, in rainbow quartz it is probably polysynthetical Brazil law twin layers, stacked parallel to the crystal's rhombohedral faces, or by thin cracks that are associated with the twin boundaries. This type of twinning is very common in amethysts, where the individual twin layers are usually large enough to be seen in a thin section under polarized light. They may get very thin, though, and have been the proposed reason for the observed color play in certain crystals from Uruguay, Morroco and India. The Indian specimens are ususally colorless but resemble the typical amethysts from volcanic gas cavities in any other respect, and some of the specimen I have seen do have a faint amethyst color. The image shows such a specimen from Madhya Pradesh, India. The effect is very subtle in most specimen and while it is easily seen on a specimen that is turned in your hand, it is very difficult to capture on a photo. 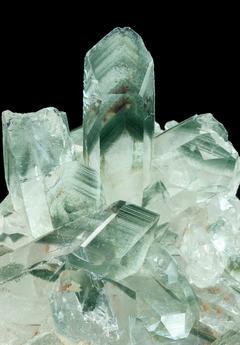 The colored reflections are not at the surface, but come from within the crystal and mix with the regular white reflection from the surface, which gives them a shine that is not unlike but much weaker than that of the infamous aqua aura gold-covered bluish quartz crystals: zones immediately under the rhombohedral faces reflect light in a colorful way, most often in green and pink. Sometimes colored reflections are only seen on parts of a crystal face. In general only a few faces of a specimen show the effect strongly, many faces do not show the effect at all. The color normally does not change with the angle of the incident light: a rhombohedral face that looks green always looks green, no matter how one turns the crystal, a pink face looks always pink. I've seen photos of a specimen with faces that show different colors depending on the angle of the incident light at the same face - and this is actually the expected behavior in interference phenomena, where light of different wavelengths are reflected or canceled out depending on the angle of the incident light. A possible explanation: the intensity of reflections at the surface depends on the angle, once the angle of incidence falls under a certain value, the reflection is total, and no light will enter the crystal. Since the twinning planes are parallel to the crystal surface, the reflections get the weaker the more shallow the angle of the incident light is. On the other hand, if the light enters the crystal roughly perpendicular to the surface, the reflections from the surface and the underlying planes are both very weak, and most light passes through. So there's only a narrow range of angles that will cause strong reflections at the twin boundaries and the color of that reflection does not change very much. This, of course, is just an untested proposal to bring the observations in line with the theory. According to Raman (1950), the light transmitted through the reflective patches is almost monochromatic, which is a strong indication of an arrangement of several twinning planes with equal distances. However, the common pink reflections cannot be caused by monochromatic light (pink is not part of the natural rainbow spectrum), only by monochromatic light passing through (and being subtracted from the reflected spectrum). Cut stones seem to show color changes of the reflections more frequently, which would be expected, because the stone's surface is usually not parallel to the reflective zone inside. 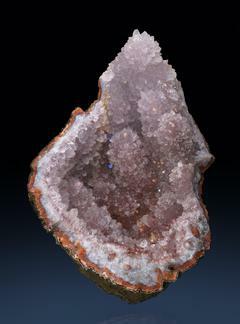 An amethyst inside a geode showing iridescence, with reflections in various colors from within the crystals. When the specimen is rotated, different crystals light up in other colors. From Sidi Rahhal, Morocco. Spirifer Collection, Poland. A scepter quartz is often defined as a quartz crystal that has a second generation crystal tip sitting on top of an older first generation crystal. The second generation tip typically becomes larger than the first generation tip, but might also become smaller. A scepter can be shifted sideways and does not need to be centered on the first generation tip. 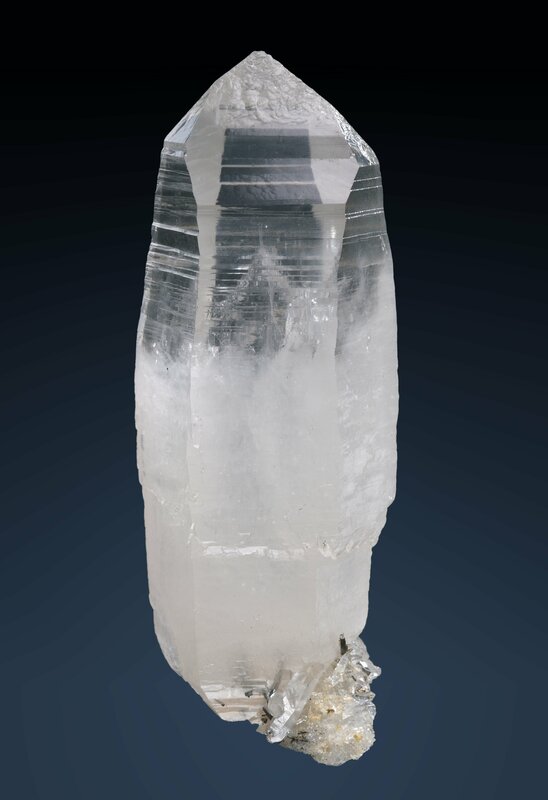 However, there is a problem with a definition that is based on the idea of a second generation: scepters do not only occur as a second generation on an older crystal, they also form stacks of parallel grown crystals that developed at the same time, very often as skeleton quartz. 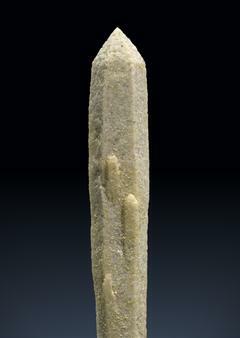 Another difficult case are reverse scepters in which the scepter is smaller than the underlying tip. Here the smaller tip very often does not show any properties that clearly distinguish it from the rest of the crystal and that would justify calling it a second generation. 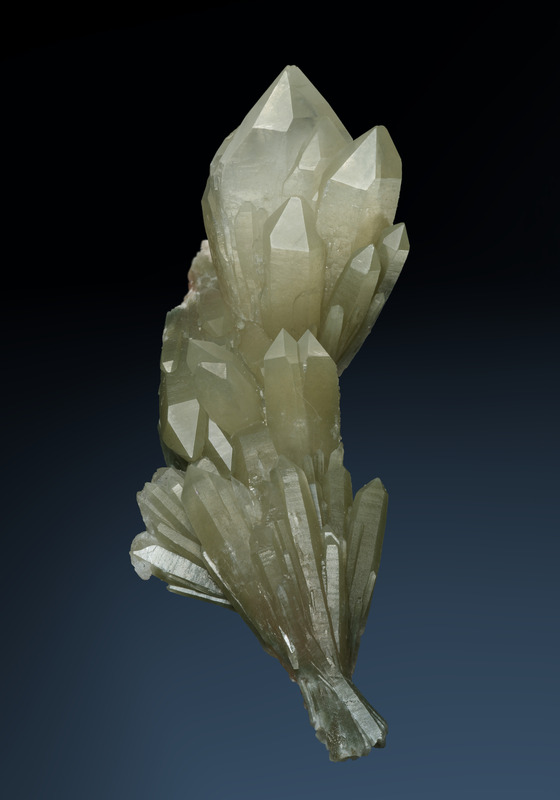 Instead, the crystals often appear to have grown continuously into the reverse scepter or multiple scepter shape. In all cases, the scepter develops from the already present crystal lattice of the crystal underneath. 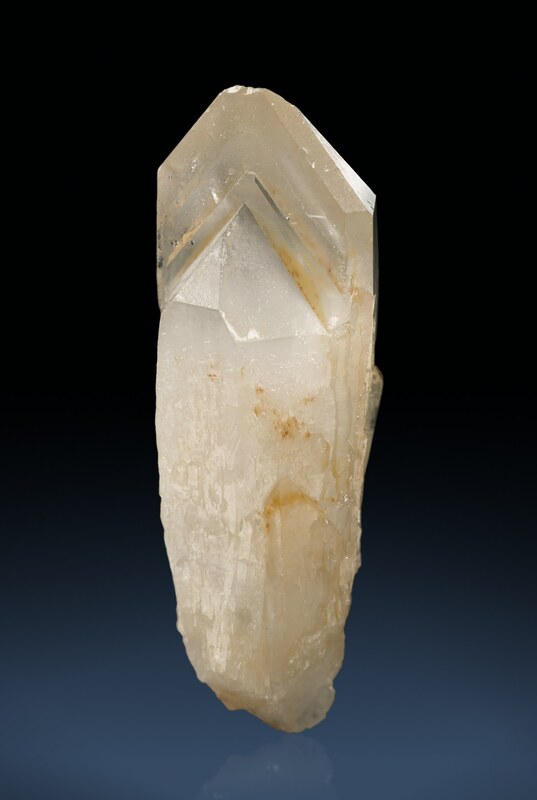 Thus, to be a scepter quartz, the "second generation" crystal's a- and c-axes need to be oriented parallel to the respective axes of the "first generation" crystal; just one crystal on top of another doesn't make it a scepter. Such a crystallographically well defined intergrowth of different minerals is called an epitaxy. 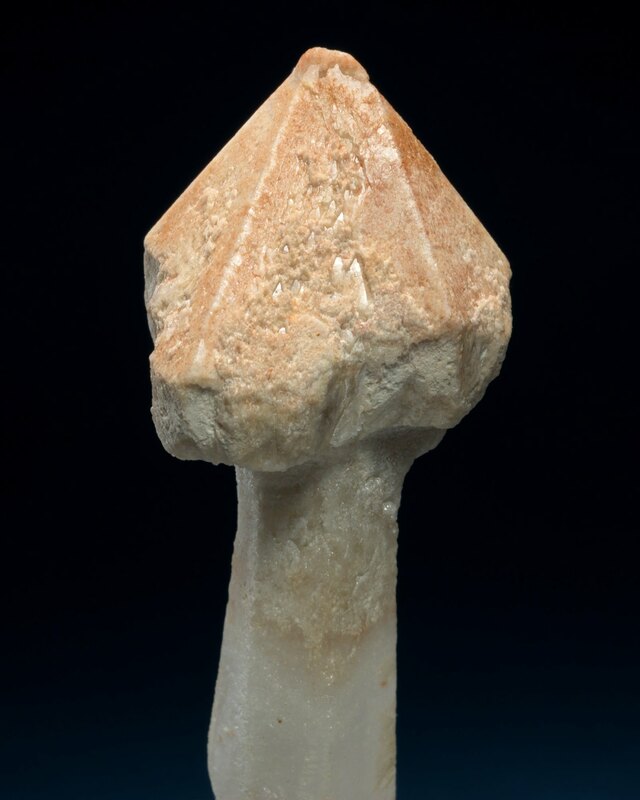 In a sense, a scepter represents an epitaxy of quartz on quartz, and because it is the same mineral, it is sometimes called an autotaxy. Scepters are quite common in certain geological environments. Amethyst from alpine-type fissures in igneous and highly metamorphosed rocks usually occurs as scepters on top of colorless or smoky crystals (not only in the Alps, but for example also in southern Norway or northern Greece). 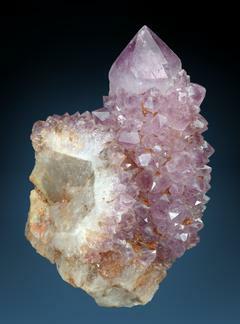 Here, the amethyst generation grew at lower temperatures than the first generation quartz. The same growth form can be observed in pegmatites and miaroles in igneous rocks (for example, amethyst scepters from the Brandberg, Namibia, or from pegmatites in Minas Gerais, Brazil). Scepters are commonly of normal habit and are never tapered. The underlying "first generation" crystal may show a Tessin habit, but the scepter on it will not. Scepters tend to assume a short prismatic habit. An apparent exception are reverse scepters and the normal scepters associated with them, which may occur as elongated extensions of a "first generation" crystal, but then in the shape of multiple stacked scepters. Many scepters show only a weak striation on their prism faces, sometimes it is even missing. Scepters do not show split growth patterns. Scepters rarely show trigonal habits with very small or missing z-faces. An exception are reverse scepters and the normal scepters associated with them. Scepters are often associated with skeleton growth forms (skeleton or window quartz). Scepters commonly show a color, color distribution, diapheny and surface pattern that is markedly different from the underlying "first generation" crystal. Often they are more colorful and transparent. Amethyst scepters are very common, smoky quartz scepters -often with uneven color distribution- are common. An exception are reverse scepters and the normal scepters associated with them which seem to either not differ from the "first generation" or show gradual transitions. Summarizing the exceptions above: Reverse scepters and the normal scepters associated with them seem to have a different set of properties. One theory is that a scepter forms when crystal growth is interrupted and parts of the crystal are covered with some material that inhibits further growth. The growth inhibiting material might be only present as a very thin layer and invisible. The very tip of the crystal or the entire rhombohedral faces remain free of that material, and should the conditions change again, the crystal continues to grow from the tip. One of the problems with that theory is that you would expect to see a larger number of "double", "triple" or "quadruple scepters", specimen in which the growth had been interrupted several times and in which scepters with slowly changing habits are stacked. In nature, however, you see a strong dominance of "simple" scepters that consist of just a prism with "a single head". If you see multiple scepters, then often alongside simple scepters, although multiple changes in the environment should have affected the morphology of all of them equally. Another problem is that you would not expect to see a fully-grown scepter that encloses the former tip like an onion if the crystal simply started growing from a single point on the surface of the tip. Such a crystal would finally grow into an elongated crystal and would at best assume the shape of a reverse scepter. As I've mentioned, amethyst from igneous and metamorphic rock locations all over the world predominantly occurs as scepters. Even if you just take Alpine locations, it is hard to imagine that the environmental conditions in all those locations have undergone a single sudden change that led to a temporary growth inhibition on the crystals, followed by a very distinctive growth pattern, the formation of scepters. The internal structure of scepters from Alpine-type fissures (and of scepters in general) is perhaps always lamellar, as opposed to the macromosaic structure of many quartz crystals from Alpine-type fissures. Quartz crystals with a macromosaic structure may carry a scepter, but the scepter will then show lamellar structure. A clear, almost colorless scepter that sits between rock crystals is shown in the first picture. This is a Schaumburger Diamant, more about them can be found in the "Diamonds" section. The tiny double terminated crystal grown on the scepter is not a scepter itself, as it is not grown parallel to the crystal underneath. A very pale amethyst scepter sits on a citrine-colored crystal whose tip is still visible as a yellow phantom. On the bottom there is another smoky phantom, although a bit blurred. This crystal is from the ridge of Peterson Mountain on the Nevada-California border, and it is also shown in the Amethyst section. This mushroom-like scepter quartz from a pegmatite deposit appears to have feldspar inclusions in its rhombohedral crystal faces. It is from the Serra Negra, Patrocínio, Minas Gerais, Brazil. Multiple scepters can be stacked, of course, as in this specimen from the small scale miners claims south of Tafelkop, Goboboseb-Berge, Namibia. The topmost crystal is not placed centrally on top of the lower crystals, but its c-axis runs parallel to theirs, so it qualifies as a scepter. The specimen is also a skeleton quartz, and the combination of skeleton and scepter growth forms is very common. A funnel-shaped scepter quartz sitting on a thin stem. It contains liquid inclusions in small irregular bubbles, as well as multiple inclusions of brown clay in the top left area that run roughly parallel to the rhombohedral face. The shape of these clay inclusions indicates that the crystal has for some time been growing as a skeleton quartz. The specimen is from the small scale miners claims south of Tafelkop mountain, Goboboseb-Berge, Namibia. This small scepter sits in a druzy cavity inside a quartz vein outlined by brownish quartz crystals. It serves as an example form a more cap-like form. The specimen was found on an old pyrite mine dump in the Colline Metallifere hills at Campiano east of Massa Marittima, Tuscany, Italy. This is an example of a scepter that sits sideways on an older smoky quartz prism. The scepter shows a very pronounced zonar coloration with a milky core and amethyst color under the rhombohedral faces and a few red flakes of hematite. The specimen came from an alpine-type cleft in gneiss near the village of Dasoto in the Kato Nevrokopi Basin, Drama, Northern Greece, at the southern slopes of the Rhodopes. 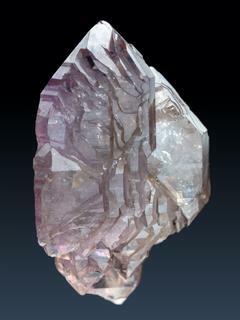 Although it is not from the Alps, it may serve as an example of the very common combination of amethyst color and scepter growth form as it is usually found in Alpine-type fissures. Donated by Anastasios Tsinidis. 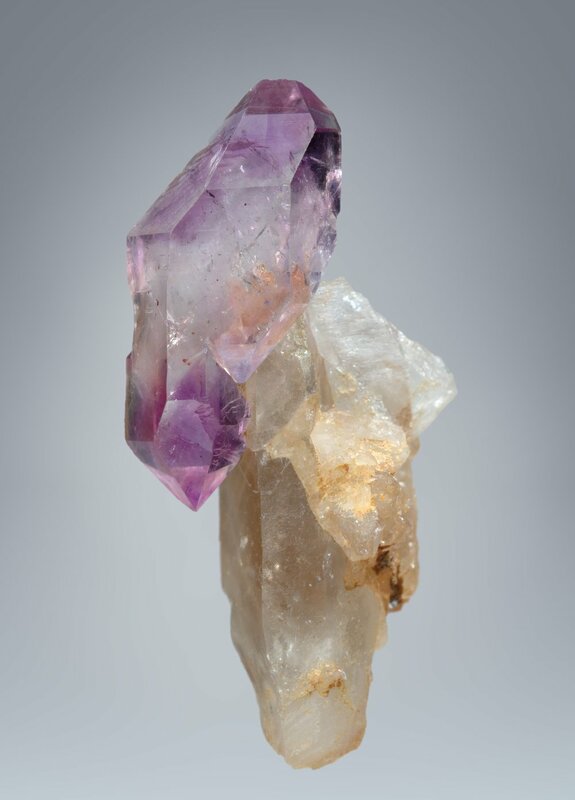 A small double terminated amethyst clinging to the scarred prism face of a large old smoky quartz of Tessin habit. It is from the same location as the previous crystal, near Dasoto village in Greece, and you can see the similarity in the zonar coloration. Why is this crystal shown in the scepter section? The crystal has a typical "scepter-like habit", it just happened to grow on the prism and not on the tip, but it did so parallel to the crystallographic axes of the older crystal, like all scepters. While an amethyst scepter on smoky quartz or rock crystal is the typical case, one can also find smoky quartz scepters on amethyst stems. This specimen probably came from from a pegmatite or miarole pocket, as there is some feldspar and epidote on the back side. The smoky scepter is not evenly colored but has color zones. 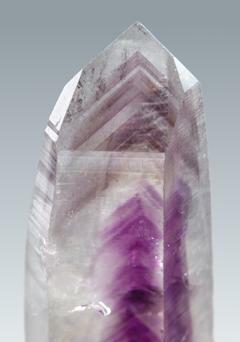 The amethyst contains numerous inclusions of shiny red hematite flakes. The smoky scepter is From the Brandberg area, Namibia. An interesting combination of different habits can be seen in this small specimen. The first-generation crystals developed into a Tessin habit with the prism faces being interspersed by steep rhombohedral faces, while the scepter shows a normal habit - as all scepters do. From an alpine-type cleft in mica schist at the Turbenalp, Binntal, Wallis, Switzerland. This is a group of reverse amethyst scepters on a volcanic matrix from Bombori, near Potosi in Bolivia. The amethyst is accompanied by white calcite crystals. The growth form and the paragenesis resemble amethyst specimen from Osilo, Sardinia, and probably nobody would object if I would claim that they actually were from Osilo. There are subtle differences, the shape and color of the calcite crystals differs, the crystals are not evenly colored, and the crystals show inclusions of greenish matrix minerals. All amethyst crystals on the specimen carry reverse scepter tips, and some of them have pagode-like transitions with several steps. The steps are not perfectly straight, but curved. The number of steps differs between the crystals, so obviously there was not a singular event or change in the environmental conditions that caused the narrowing. In skeleton quartz the edges grew more quickly than the faces, so the edges stand out like the frames of a window. Crystals that grow very quickly often develop skeletal growth forms -- other examples are gold and rock salt crystals with hopper growth or snow flakes. 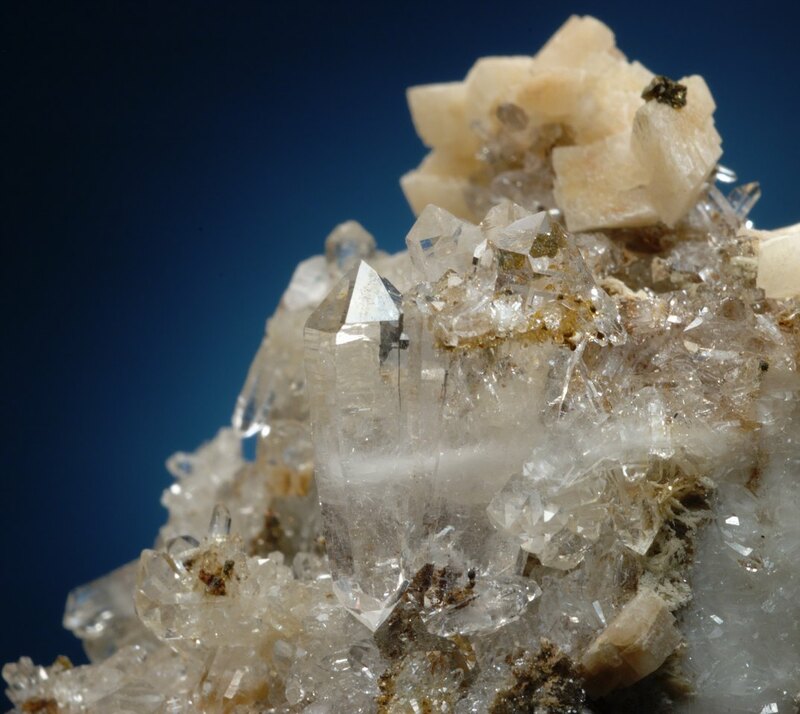 In German literature this growth form of quartz is known as "Fensterquarz", and the translation, window quartz is gaining popularity, as it is - at least for quartz - a more descriptive term. 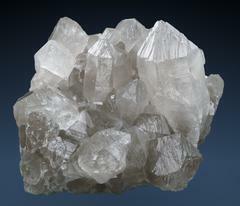 Occasionally the terms frame quartz and cavernous quartz are used. The term skeleton quartz is indeed a bit confusing as the crystals have not been "skeletized" by dissolution. The faces on a skeleton quartz will grow from the edges to the center. Sometimes these faces simply grow as thin transparent plates, then usually several generations of them can be found, separated by empty spaces. Should these plates finally be completed, the watery solution inside will be trapped behind a "window". Skeleton quartz often shows unusual surface patterns and curved distortions of the faces. These might look like fractures but are growth forms. Skeletal growth is indicative of an unrest geological environment with rapidly falling temperatures and/or pressures. Many skeleton quartzes show inclusions of clay and other detrital pocket material, often captured in large cavities. The sedimentation of fine pocket material takes place quickly compared to the speed of growth of crystals, even that of skeleton quartz, so one would not expect any detrital inclusions in the outer layers of a crystal. The inclusions of clay might be explained by tectonic activity shaking up the fine detritus, or by a boiling watery solution in which this detritus cannot sediment. The fluid and gas inclusions that are often found in skeleton quartz seem to support the latter view, but many biphasic inclusions (that consist of a gaseous and a liquid phase) were monophasic (either liquid or gaseous only) when they were enclosed and became biphasic inside the crystal at lower temperatures. The volcanic Goboboseb-Berge (Goboboseb Mountains) in Namibia are renown for nice scepter and skeleton quartz, often amethystine or smoky in color, with inclusions of minerals, fluids, or clay, as the specimen from the small miners claims south of the Tafelkop mountain shown in the picture. 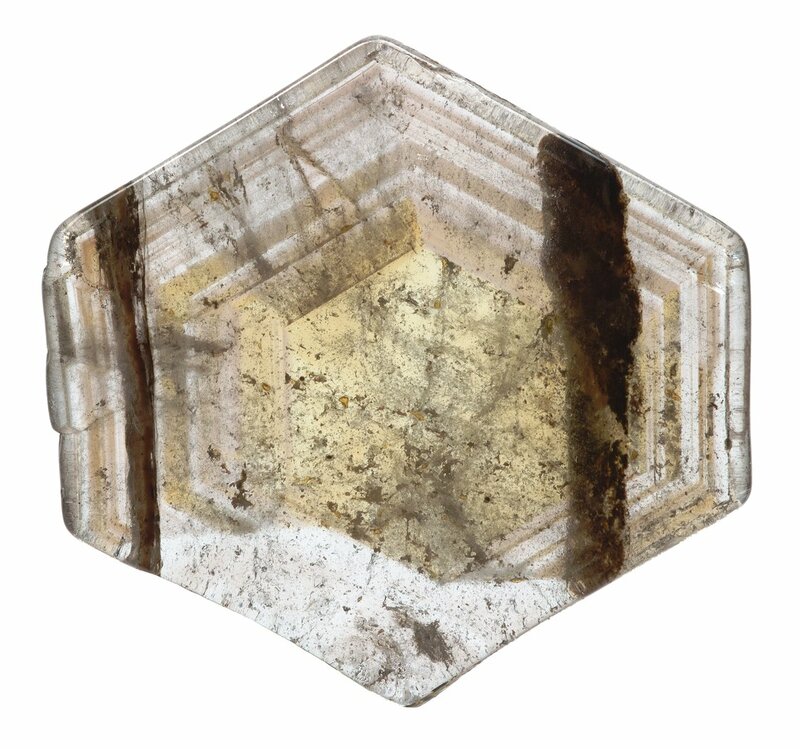 This smoky scepter quartz from the same location as the first specimen has very nice rectangular windows on its prism faces and triangular windows on the rhombohedral faces. Another smoky skeleton quartz from the Goboboseb-Berge in Namibia, showing much more irregular "windows" and large, golden inclusions of clay. 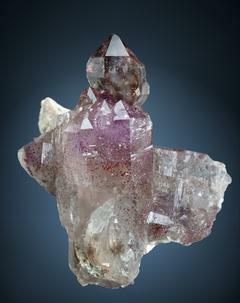 Another skeleton quartz with amethyst color from the area south of the Tafelkop, Goboboseb-Berge, Namibia. 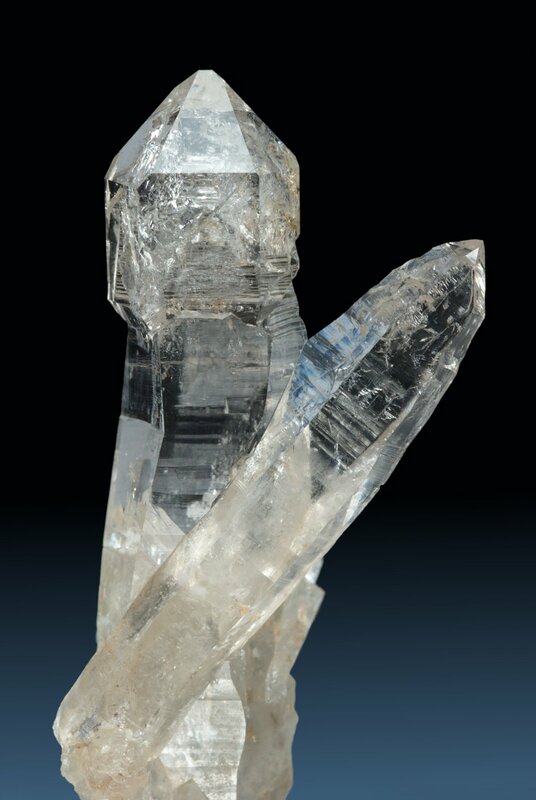 A double-terminated skeleton quartz from India, showing the typical "windows" on all faces. The Val d'Illiez in Valais/Wallis, Switzerland, is a classical alpine skeleton quartz location. It lies north of the Mont Blanc massive. The crystals can be found in alpinotype vugs in so called "Flysch" sandstone and limestone. The dissolution of organic matter from neighboring slates led to a quickly increasing methane content of the watery solutions. This decreased the solubility of silica and caused a quick growth from an oversaturated solution. 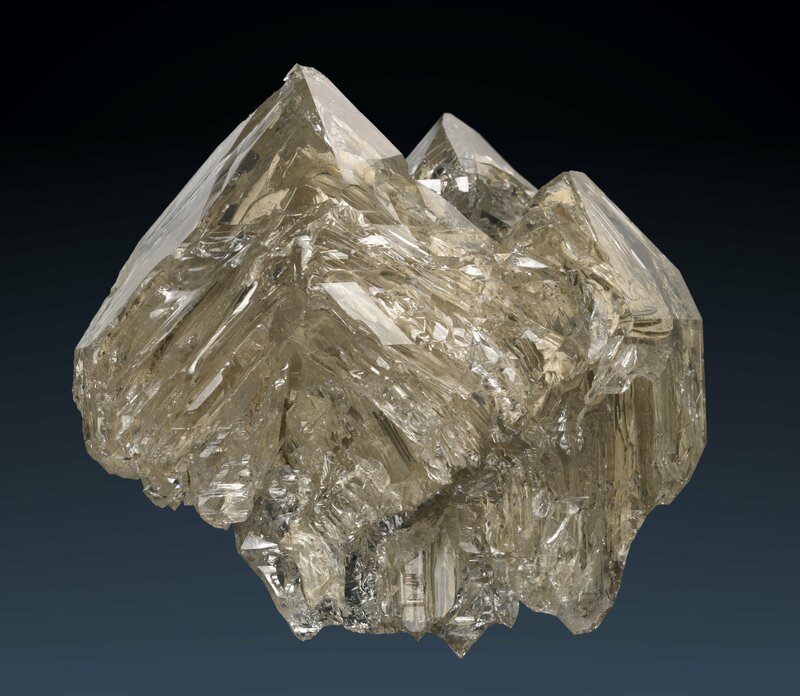 In this rock crystal the "windows" on the rhombohedral faces are not very deep, but the typical skeleton growth surface structure has led to a rough crystal surface. 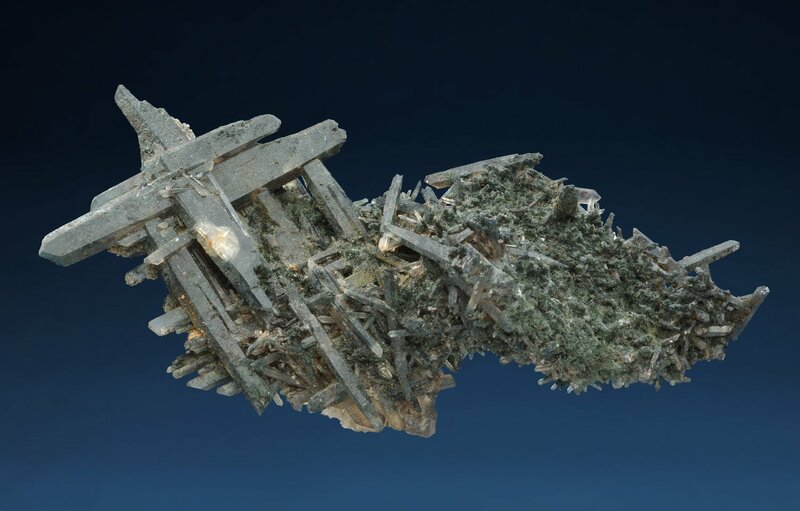 This crystal is from an alpine-type fissure in the Bündnerschiefer mica schist at the Holzjihorn, Binntal, Wallis, Switzerland. Not all crystals in a pocket need to show the same growth forms and habits, as can be seen in this interesting small cluster of rock crystals of various habits. The large central crystal shows typical skeleton growth-patterns on its crystal faces, right before it there is a crystal with normal habit and a flat prism face. 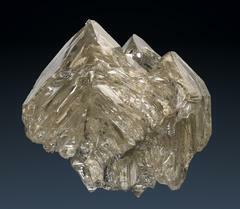 The other crystals are of a stubby, barrel-shaped Tessin habit, also called Binntal habit. The specimen is from the Turbenalp, Binntal, Wallis, Switzerland. This skeleton quartz has a bizarre shape - there is even a small hole going through it. Except for the rhombohedral faces at the upper right corner, only skeleton growth surface patterns can be seen on this crystal. Also from the Turbenalp, Binntal, Wallis, Switzerland. 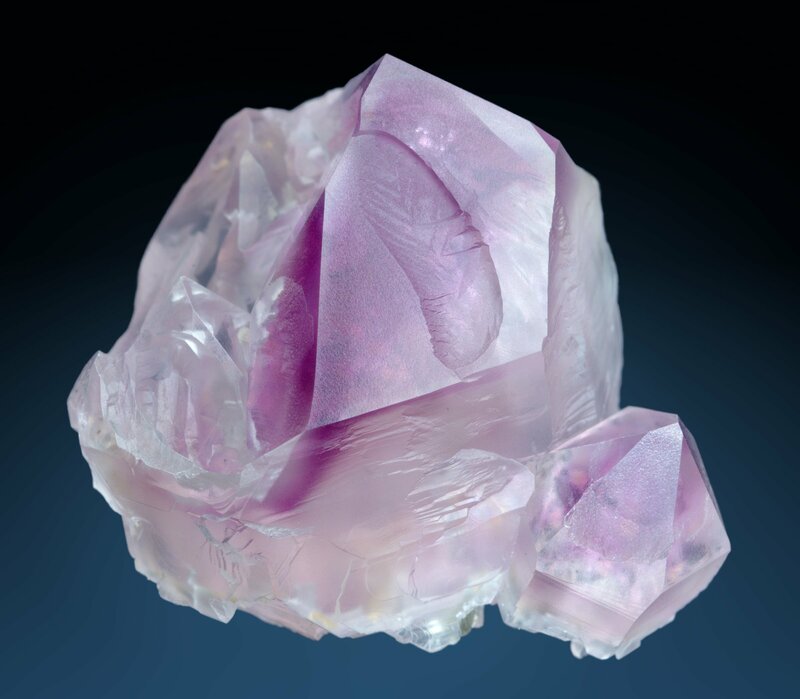 An example of a combination of scepter-like and skeleton growth forms and zonar amethyst color. The crystals have a slightly rough surface and are not perfectly clear, but the color is quite deep for its size. 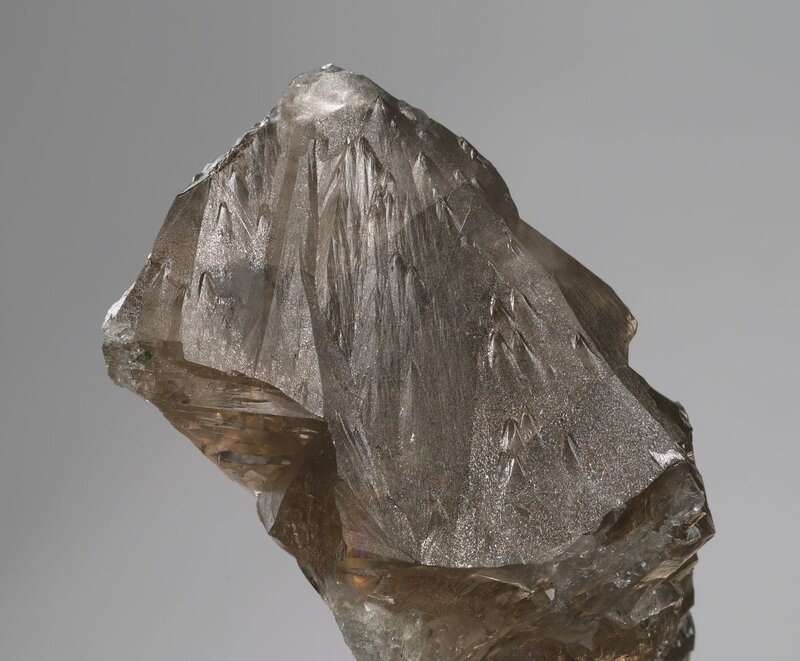 The irregular shape at the left side of the specimen and the kidney-shaped indentation on the large rhombohedral crystal face are not damages but typical skeleton quartz growth forms. From the Mörchnerkar area in the Zillertal Alps, Tyrol, Austria. While this amethyst is not a typical skeleton quartz, it is a nice example for a typical growth pattern found on skeleton crystals: their sheet-like growth, an indication of their internal onion-like lamellar structure that is commonly found in scepters and skeleton quartzes. The crystal is from an alpine-type fissure at the Kato Nevrokopi basin in northern Greece. Donated by Anastasios Tsinidis. Of all skeleton quartz crystals those found in the vicinity of Poretta Terme in the Italian Appenines seem to be the most shiny ones. They are filled with a very fine light yellow-gray clay and have smooth and lustrous, in part curved crystal faces. Very often they form aggregates of two or more crystals, like these two parallel grown crystals. From Poretta Terme, Emilia Romagna, Italy. 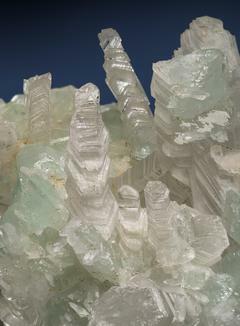 The large crystal to the left looks as if it was made of several growth "layers" nested in an onion-like manner, with the layers being separated by bright pocket clay. The "layers" are not separated from each other, of course. From Granaglione, south of Poretta Terme, Emilia Romagna, Italy. Donated by Luigi Agostini. Skeleton quartz frequently appears as crystal aggregates, and often these consist of parallel grown crystals, like this group with the typical pocket clay inclusions from Poretta Terma, Emilia Romagna, Italy. The term "star quartz" is a litte bit confusing as it seems to indicate asterism, like it is observed in star rose quartz from certain localities, and some people use the term in this sense. Here the term is used for aggregates of more or less equally sized quartz crystals that radiate from a common point and form star-shaped spheres. These grow only rarely in hydrothermal fluids inside cavities to form freely "floating" and complete spheres. 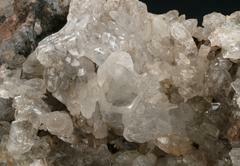 More commonly authigenic quartzes form hedgehog-like aggregates and spheres that qualify as star quartz. Quartz crystals also radiate from small chalcedony spheres. Quartz aggregates that are sold as ocean jasper occasionally contain small cavities outlined by green quartz crystals. These belong to star quartz balls that grew from a small chalcedony sphere in their center. 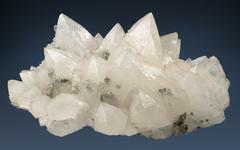 This rather unusual specimen is made of many star quartz balls with 1 to 2 cm diameter. Those on the left side still have the yellow chalcedony spherulites in them, on the right side most of them contain just a small spherical cast. The pink vein filling on the top of the specimen is made of agate. The second image is a close-up of the quartz stars and a cavity. 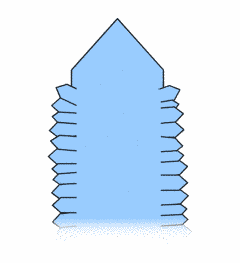 The crystal tips have a trigonal habit and are made of curved rhombohedral faces. Interestingly the center of the quartz stars is more transparent and has a different hue. The crystal tips show a subtle banding, and first this looks a bit like phantoms. But the banding always runs from the upper left to the lower right, irrespectively of the crystals' orientation. This is an indication that the banding predates the crystals and that they grew in an already layered medium, perhaps a silica gel. From the Morovato Mine, Ambolozo peninsula, Madagascar. Here I present odd looking specimen that do not fit into any of the presented growth form categories. 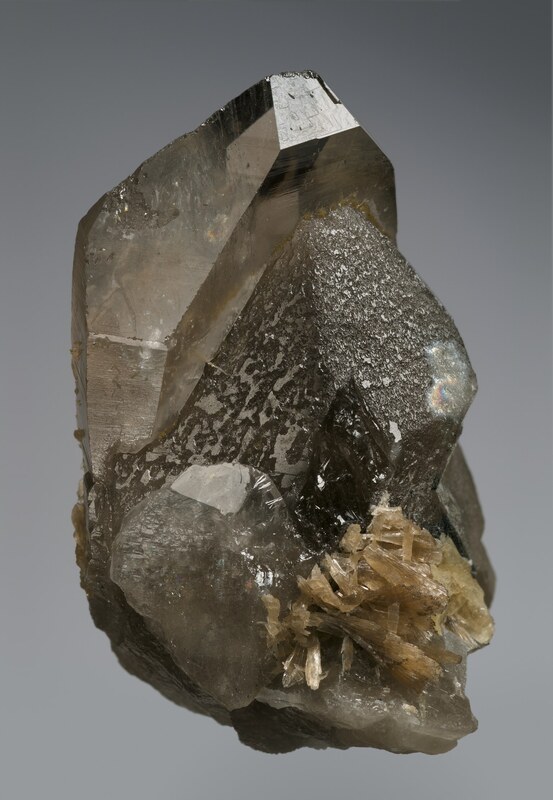 This smoky quartz specimen is from the famous pegmatite locality Strzegom in Lower Silesia, Poland, very likely from the Grabina II quarry. There are several plate-like aggregates of roughly parallel grown quartz crystals with milky layers in the center of the plates that look a bit like a "faden". Of course these are not faden quartzes (and one would not expect to find faden quartz in a pegmatite pocket). 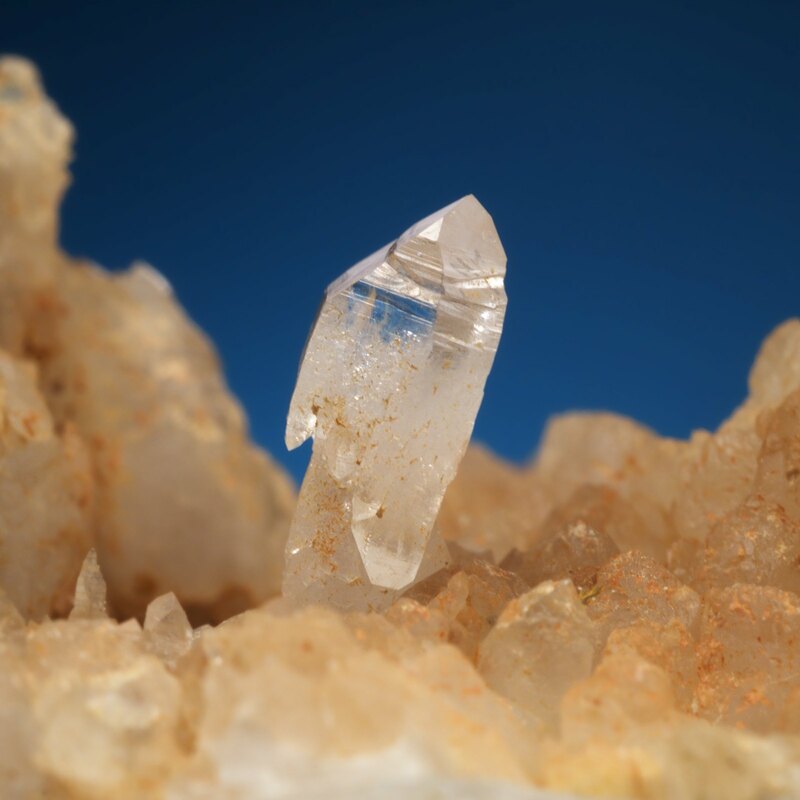 A closer examination reveals morphological differences to faden quartz: The prism faces of many crystals are resolved into smaller faces, and the crystals are not perfectly parallel. A possible explanation: Quartz veins had formed in cracks inside an unknown mineral or rock. The mineral or rock got dissolved but the quartz veins withstood the changing conditions, and quartz crystals grew from the both sides of the vein quartz. Sometimes the tips of quartz crystals assume a peculiar shape that reminds one of skeletal growth forms: the edges between the rhombohedral faces and sometimes also the edges between the prism faces stand out like ribs. This growth form is most commonly associated with split growth phenomena on sprouting quartz crystals, but also found on cathedral quartz crystals. This can go to the extreme, with star-shaped habits or crystals that have large ribs standing out from the prism like the buttresses found on gothic cathedrals. In Norway shiny crystals of that shape have been found together with hematite near the Tinnsjø lake, Telemark, and are called "rocket quartz" by the locals. Star-shaped, stubby crystals have been found in Madagascar. This particular crystal is from Itamarandiba, north of Diamantina, Minas Gerais, Brazil. It has a translucent smoky quartz core and the split growth layer and ribs have grown as an almost opaque white secondary layer on top of it. Note that the forementioned crystals of similar growth form from Norway and Madagascar are translucent and shiny. The second image is a top view of the same crystal that shows that the growth pattern is developed on each of the large rhombohedral faces at the tip of the crystal. The edges between some of the prism faces also have a very weakly developed rib. The third image emphasizes the split-growth on the prism faces. None of the smaller rhombohedral faces of the sprouting crystals that grew on the prism faces shows the same pattern as the large rhombohedral faces at the crystal's tip, which is different from what can be seen on many artichoke and sprouting quartzes: these show a fractal-like repetition of the patterns over a wide range of scales, as shown on this specimen from Romania. The surface of the prism faces is rough, very similar to that of scepter quartzes from the Serra Negra, and apparently causes growth inhibition, as shown in the last image, where the individual crystals sprouting out of the prism faces show a mushroom-like habit because an extra, shiny layer of quartz formed only on the rhombohedral faces. At first it looks a bit like a gravitational precipitation of material, but right below the center you see a crystal sprouting in the downward direction, and it looks like an inverted "mushroom", so it is indeed a selective inhibition of growth on prism faces. I do not have a name for this growth form, but often such crystals are simply called sprouting quartz because of the dominant split growth surface patterns. I also cannot tell if the the development of the frames and ribs is caused or influenced by the split growth. 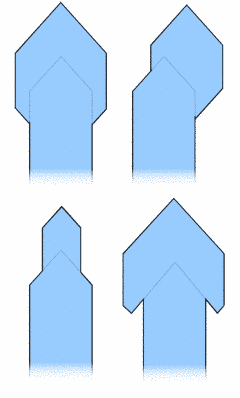 In the German-speaking part of the Alps, collectors call a number of different growth forms "Skeletquarz", including the one shown on the photo. Although this term is a literal translation of the English term "skeleton quartz", it does not necessarily mean the same thing. 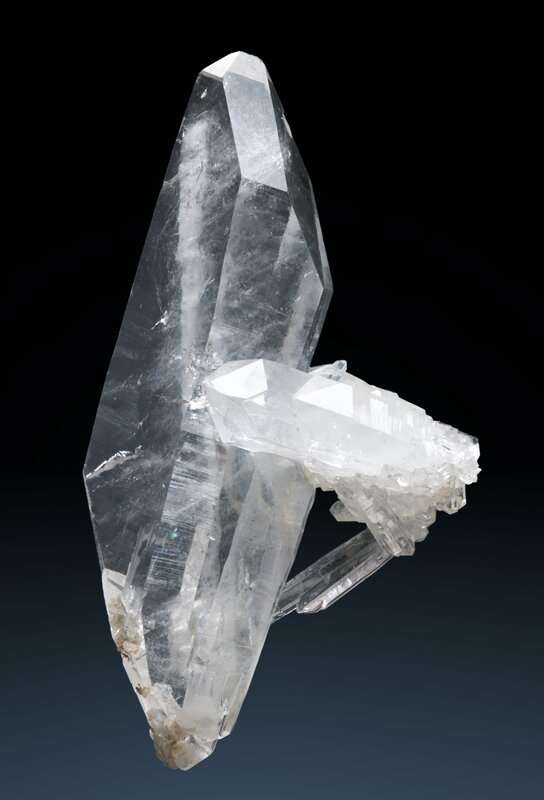 Most collectors will call the skeleton quartz growth form introduced above "Fensterquarz", while "Skeletquarz" is more often used for growth forms with irregular or jagged surface patterns and irregular crystal shapes that are often caused by partial dissolution of the crystal. The growth pattern observed on this particular specimen is probably caused by the re-growth of a formerly partially dissolved or growth-inhibited crystal. The crystal is from the Val Maighels, Tujetsch, Graubünden, Switzerland. A strange surface structure developed on this irregularly shaped crystal. It might be the result of some growth inhibition by pocket clay. From an alpine-type fissure at the Rot Wichel mountain, upper Fellital, Gurtnellen, Kanton Uri, Switzerland. So far I could not come up with a reasonable explanation for this very odd growth pattern. Suggestions are welcome. From an alpine-type fissure at the Secunda Muotta, Val Giuv, Tujetsch, Graubünden, Switzerland. 1 There is one exception form this "rule": Ametrine can only be identified as such if the sample contains both amethyst and ferruginous parts, otherwise it will appear as an amethyst or ferruginous quartz/citrine. 2 "Rainbow colored" is actually not correct. There are pink reflections, and pink is not part of the natural rainbow spectrum. The colors appear because parts of the spectrum are canceled out, so some colors are subtracted: If you subtract green from white, you will get the pink that is absent from a rainbow. 3 Thanks to Yuko Tanaka, Colorstone Mithrill, Japan, for pointing this out. I initially thought that the color does not change at all because I did get some parts of the interference mechanism wrong. 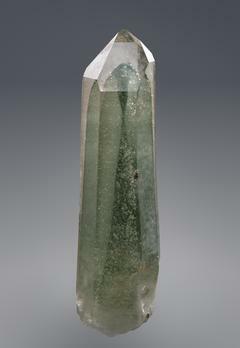 4 Thanks to Yuko Tanaka, Colorstone Mithrill, Japan, for for providing photos of cut stones. 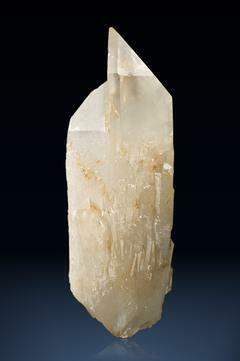 5 To the collector of Bolivian minerals this is the most interesting thing about the specimen: calcite is extremely rare in Bolivia.